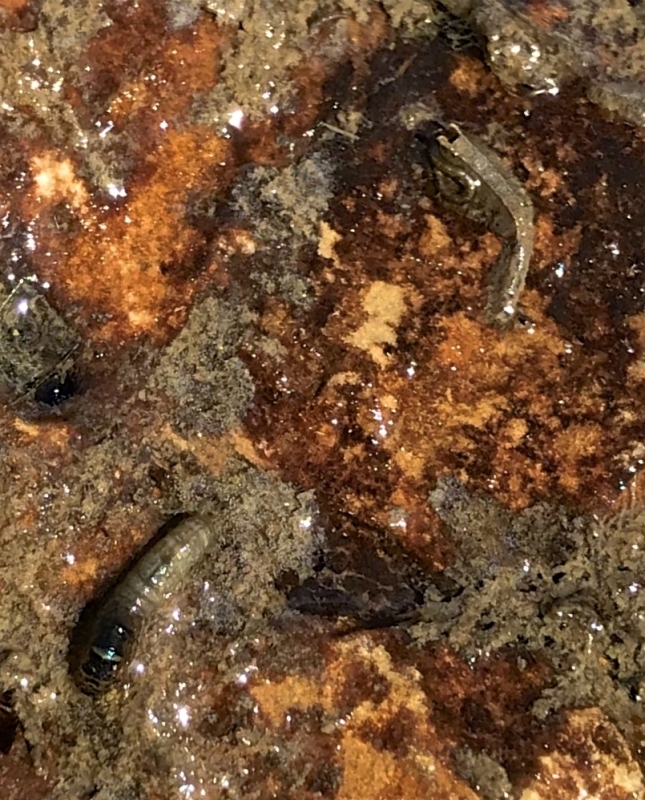 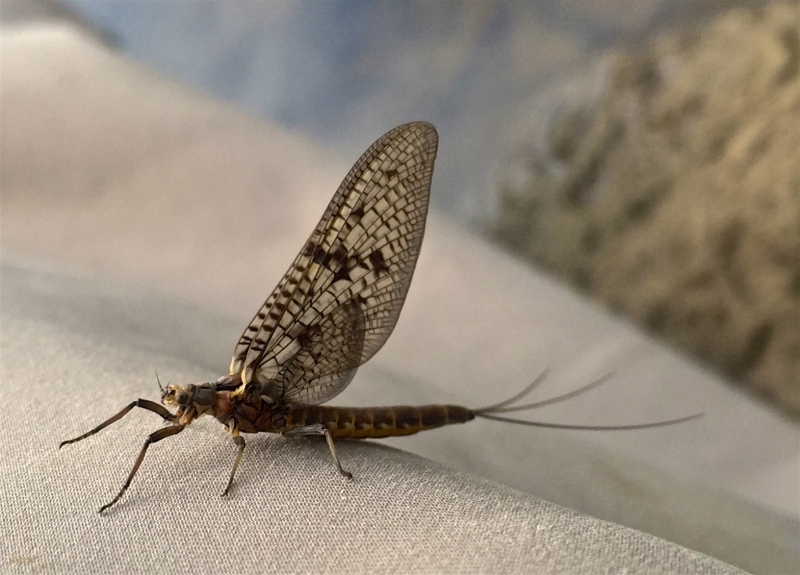 During the Inland Trout Season, even if not Guiding or Teaching, TFC’s Guides and Instructors are on the water almost EVERY day learning about nature’s timing. 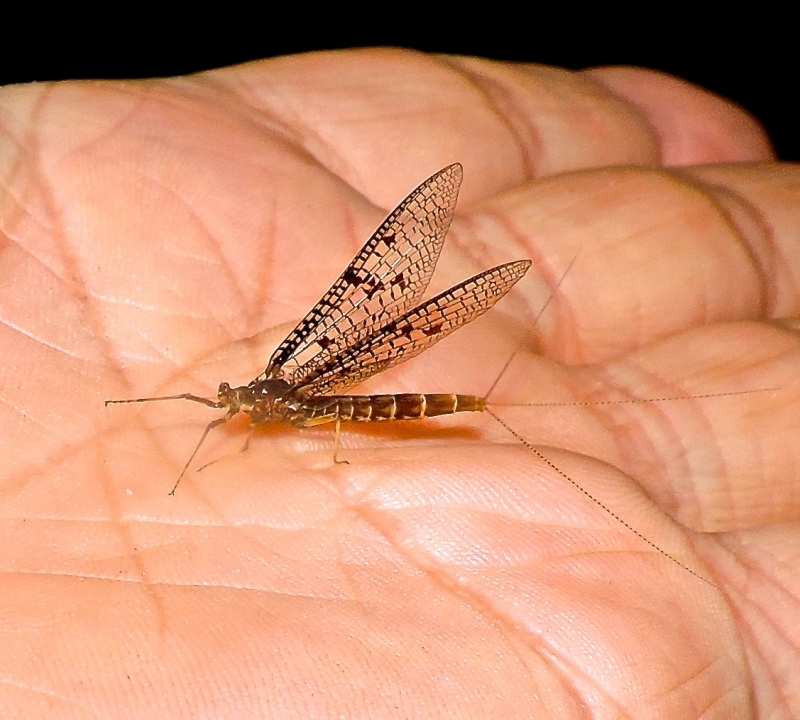 To be a successful fly fisher we must embrace these seasonal schedules and know their timing on our local streams. 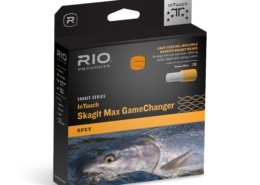 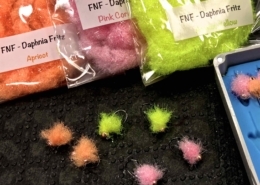 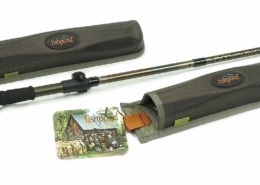 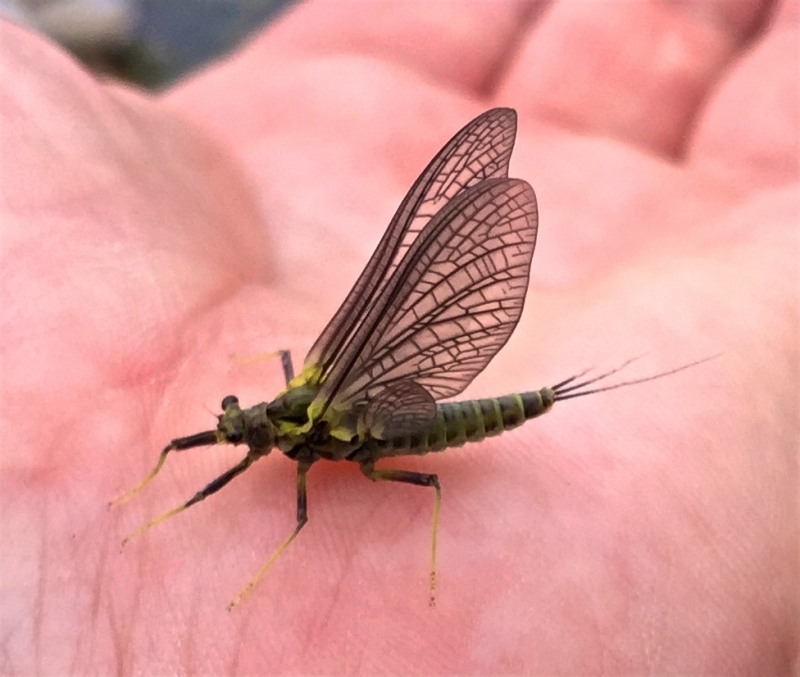 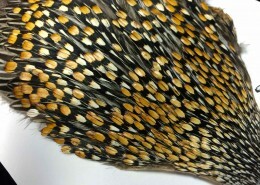 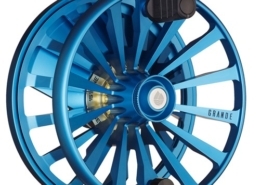 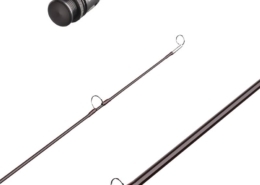 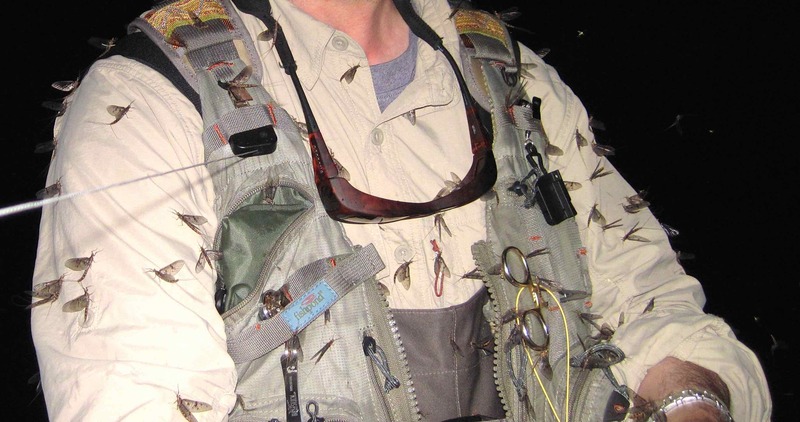 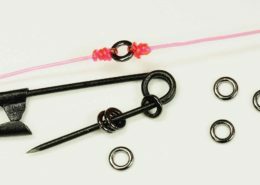 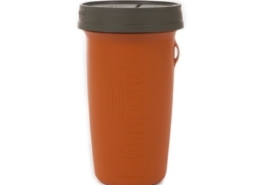 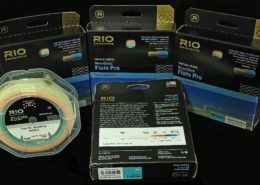 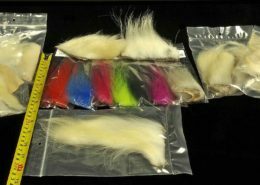 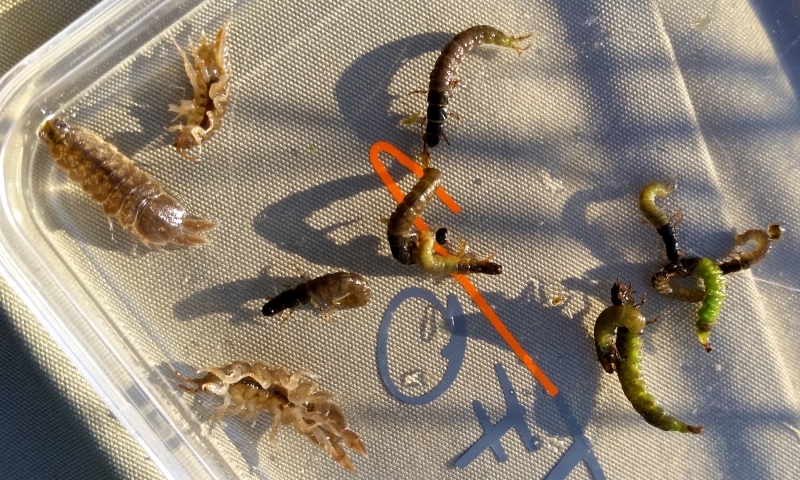 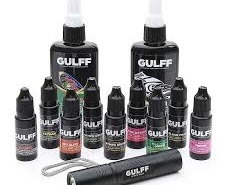 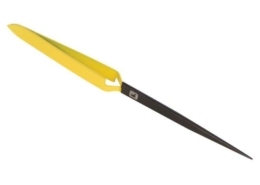 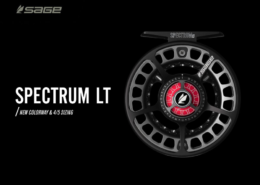 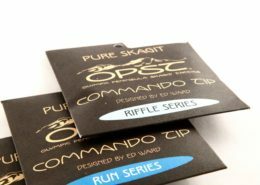 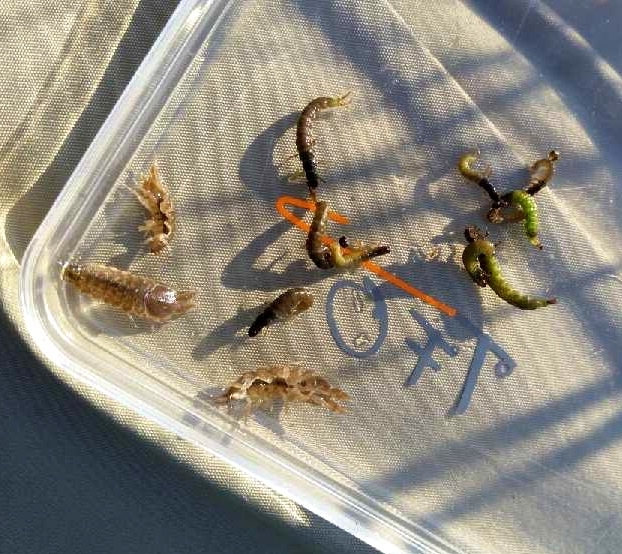 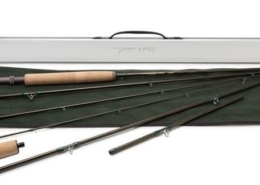 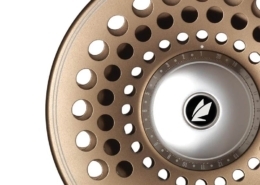 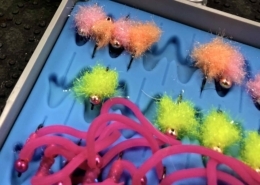 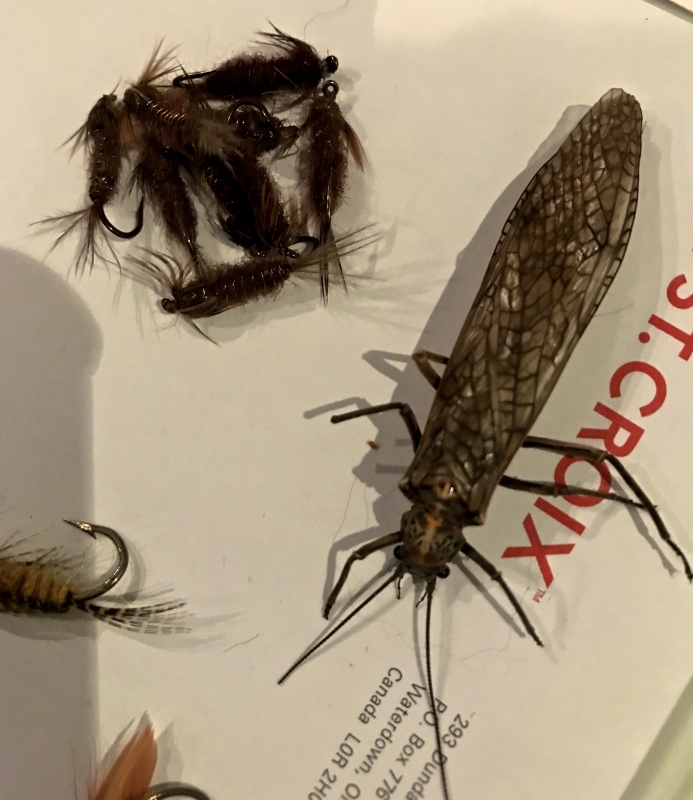 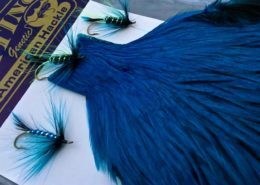 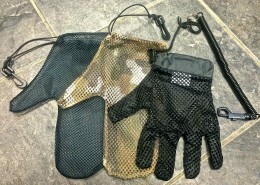 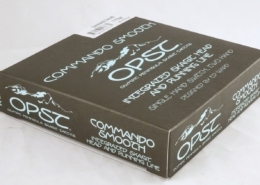 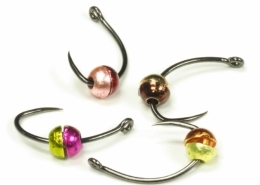 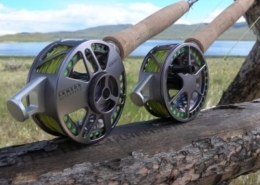 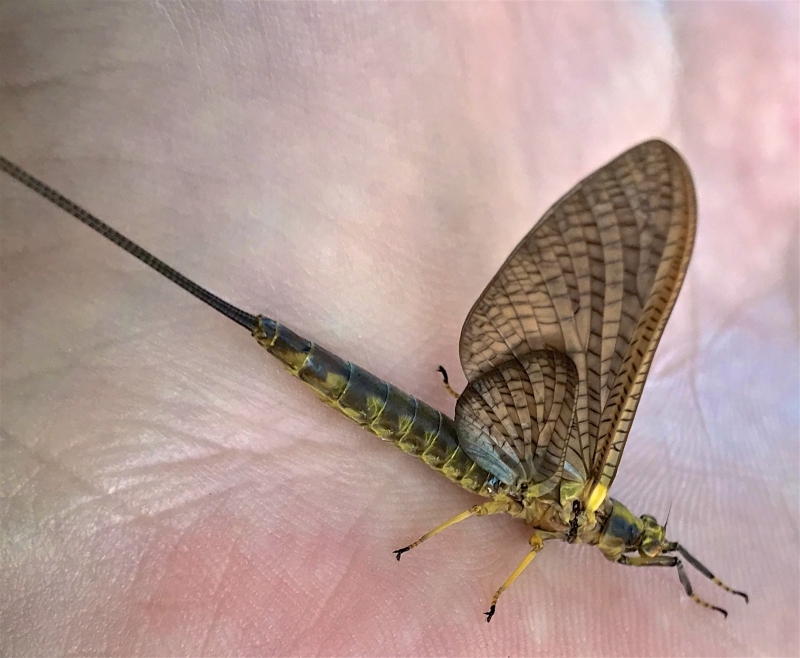 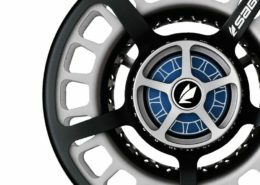 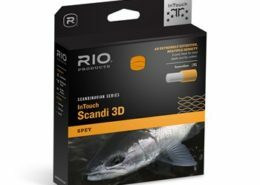 Hatch charts can help you pick out the appropriate flies and tackle that you are likely to need for an upcoming fly fishing trip. 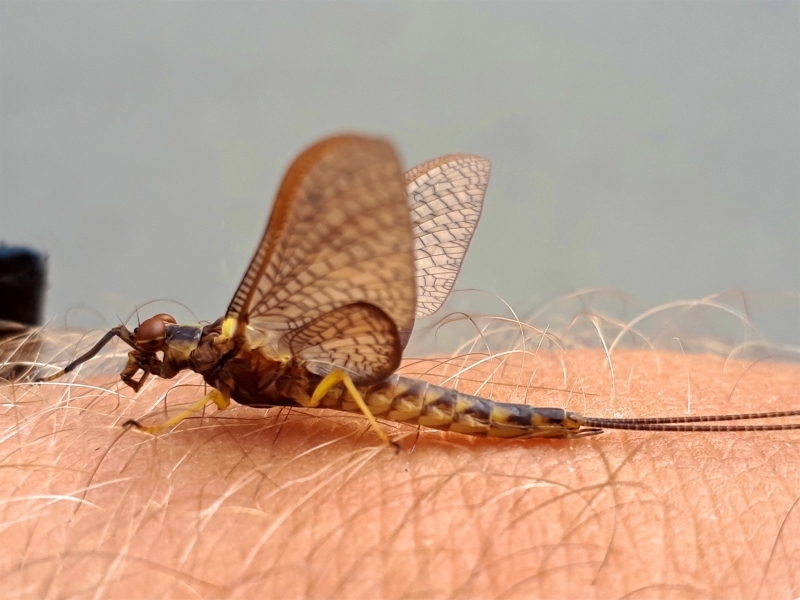 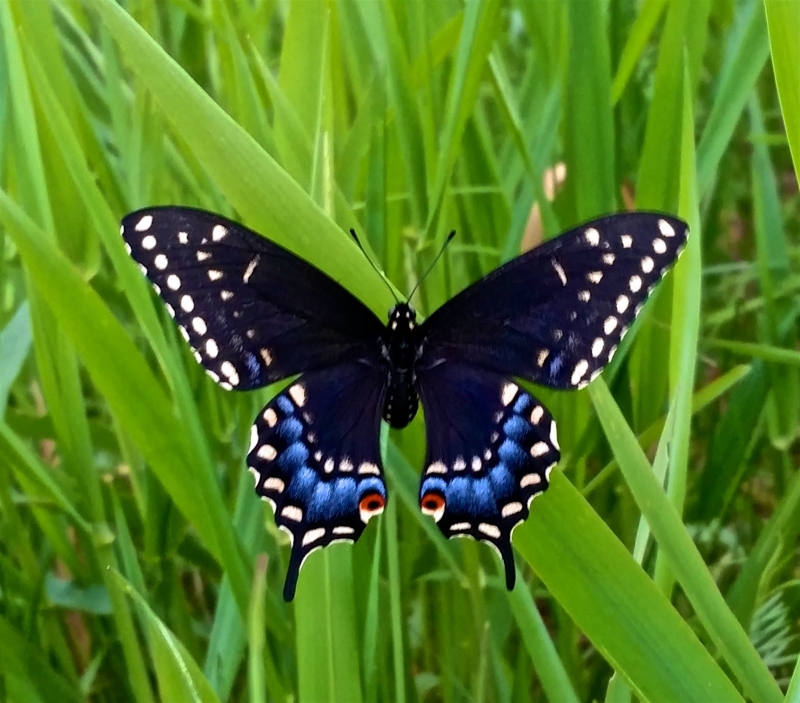 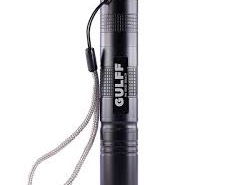 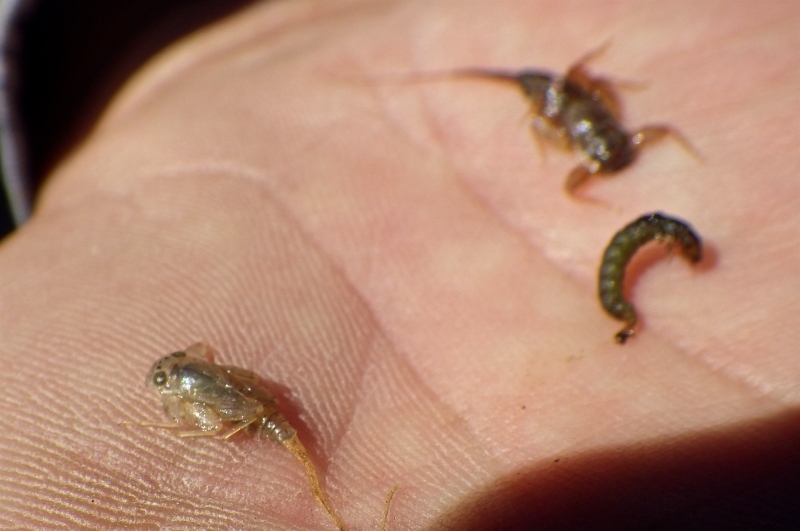 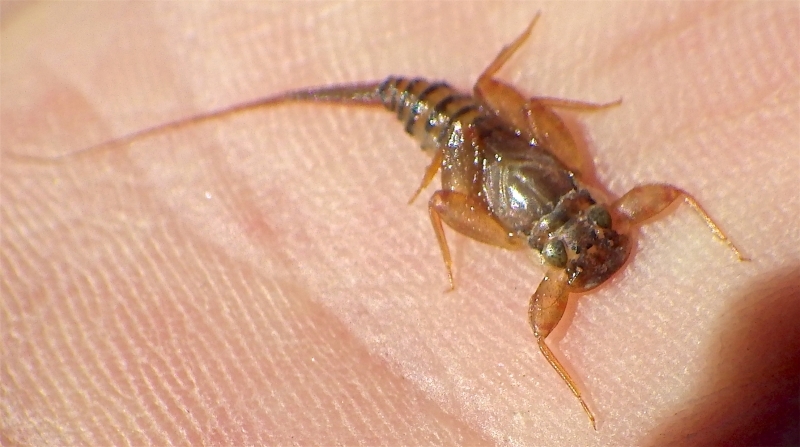 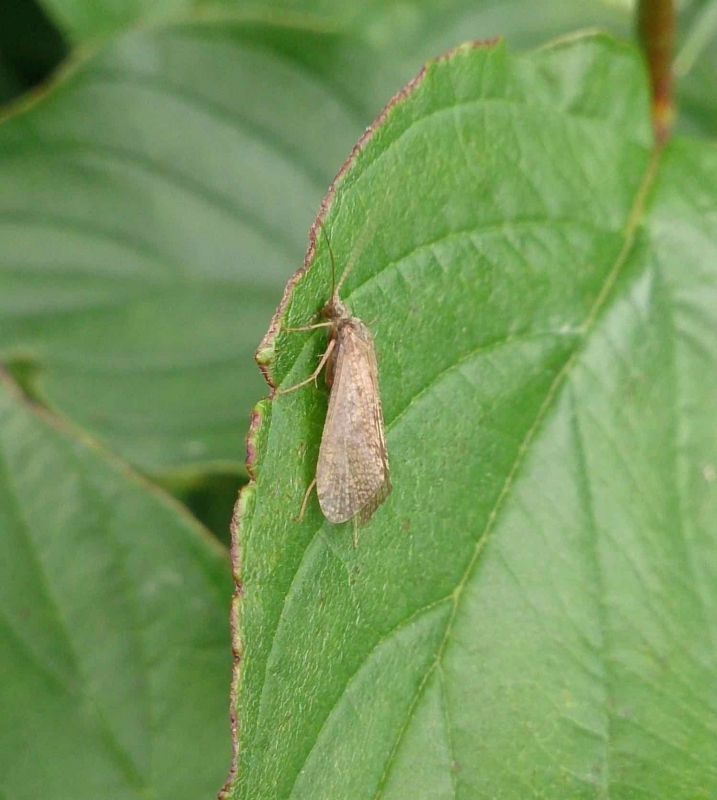 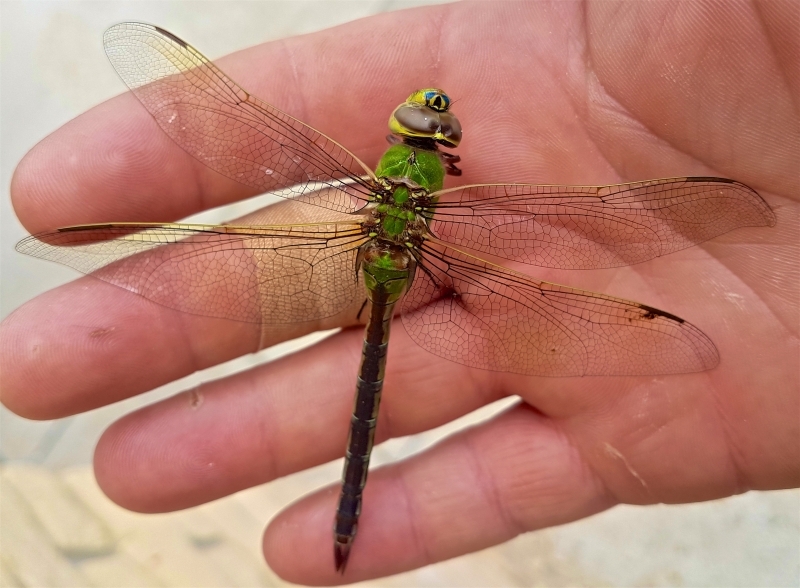 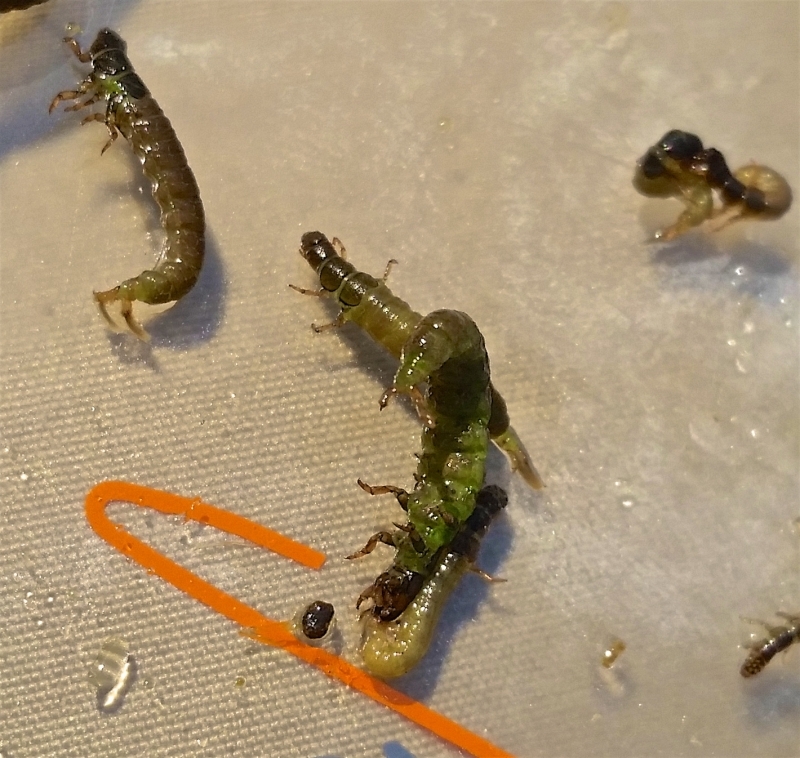 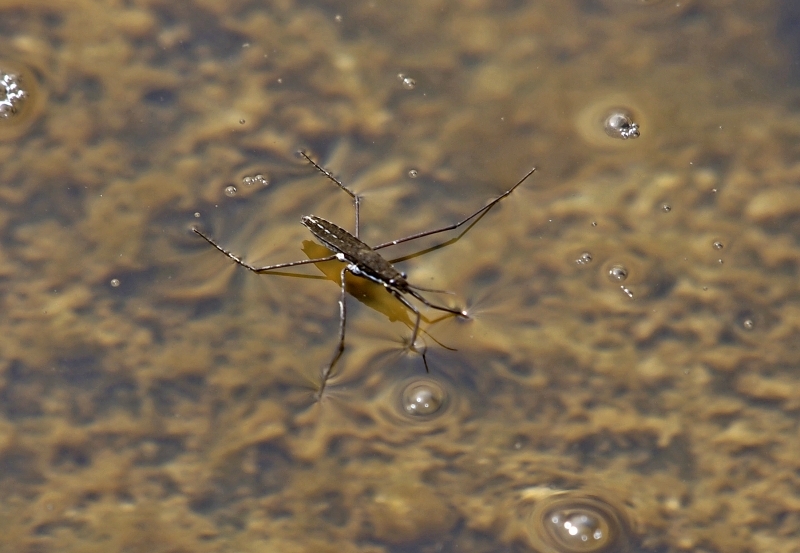 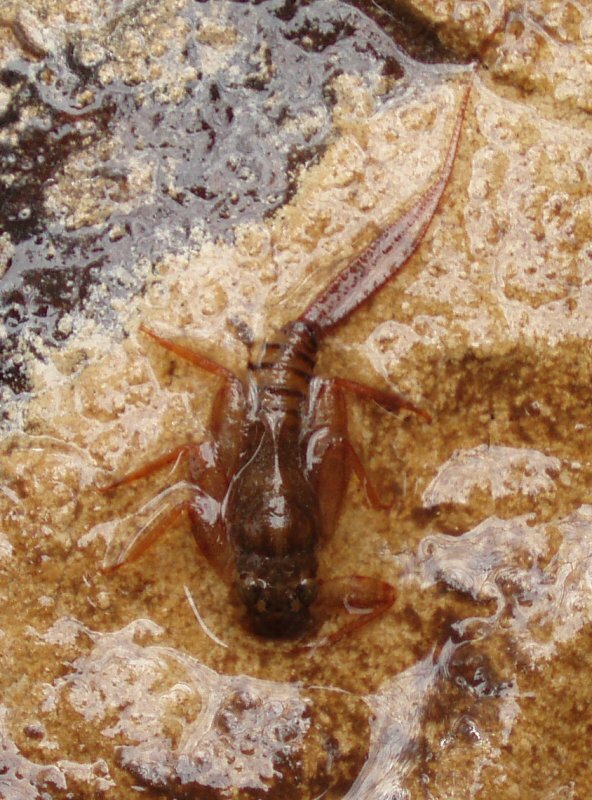 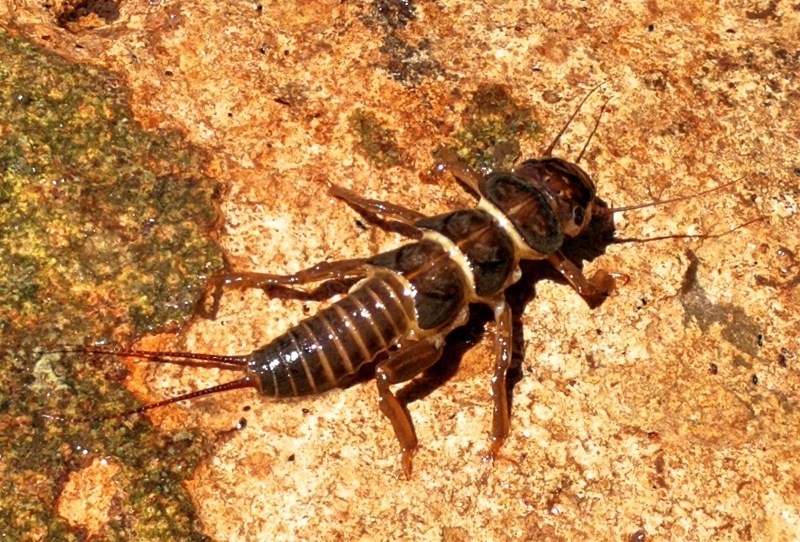 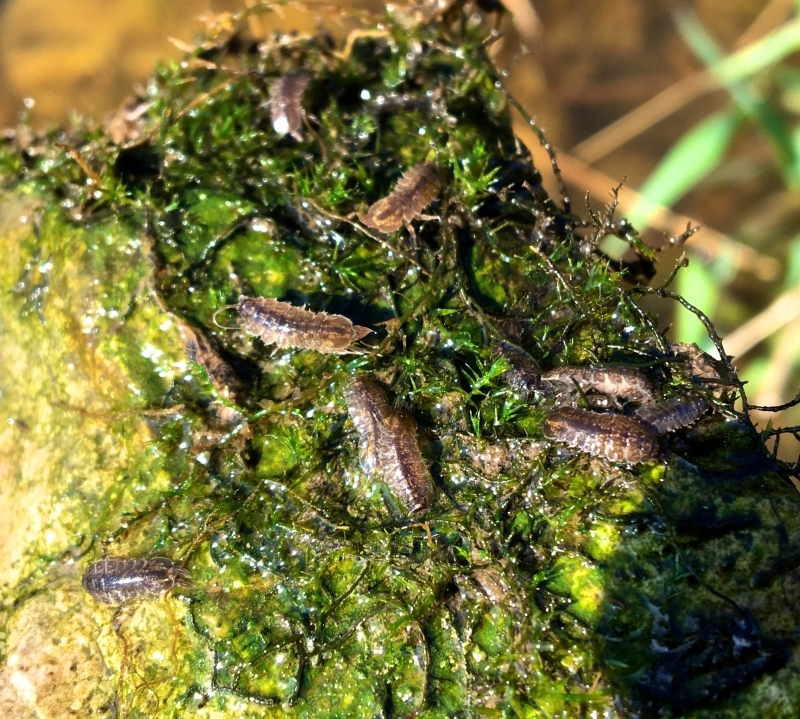 They should never be taken as gospel, but rather as a general guide to expected aquatic insect activity. 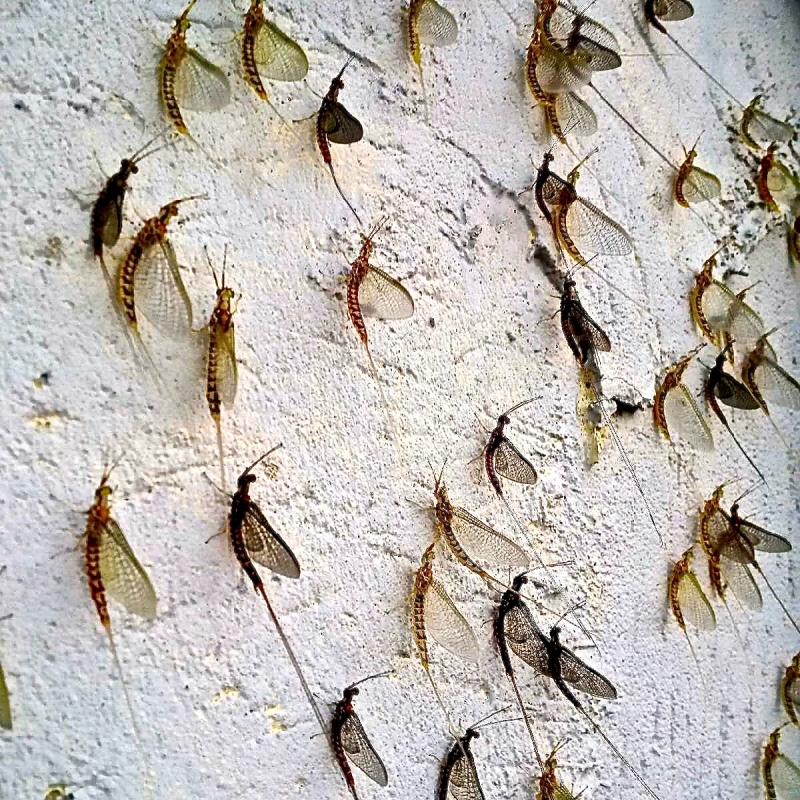 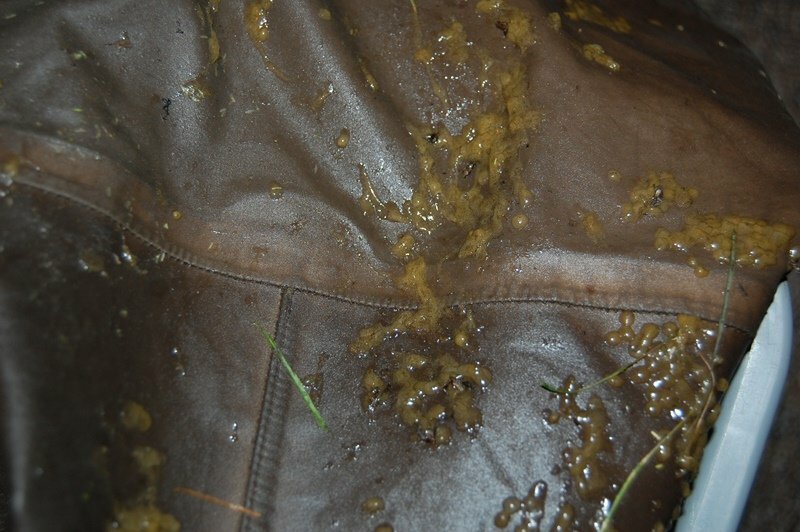 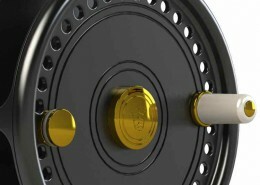 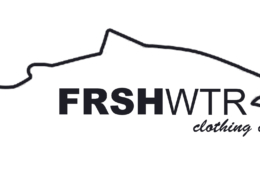 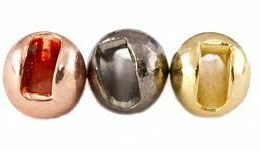 Weather and water conditions can cause significant changes in the timing and duration of the hatches. 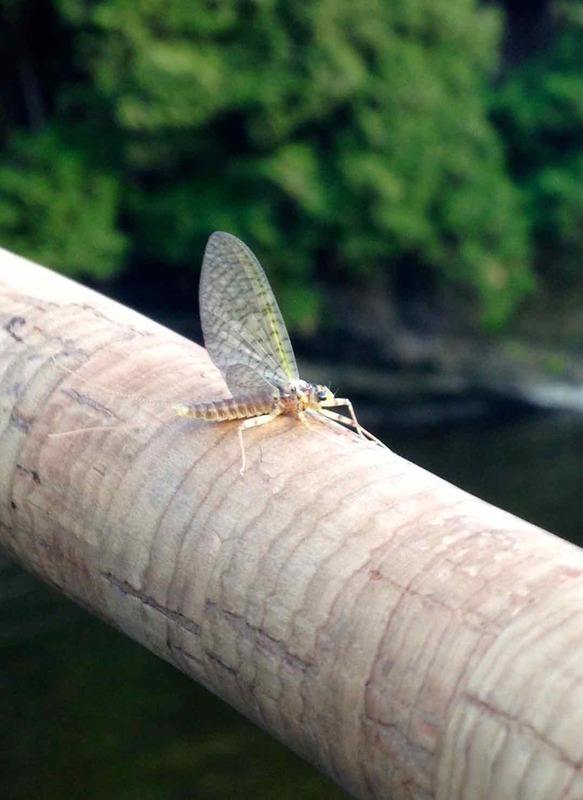 See here for our Guiding Services. 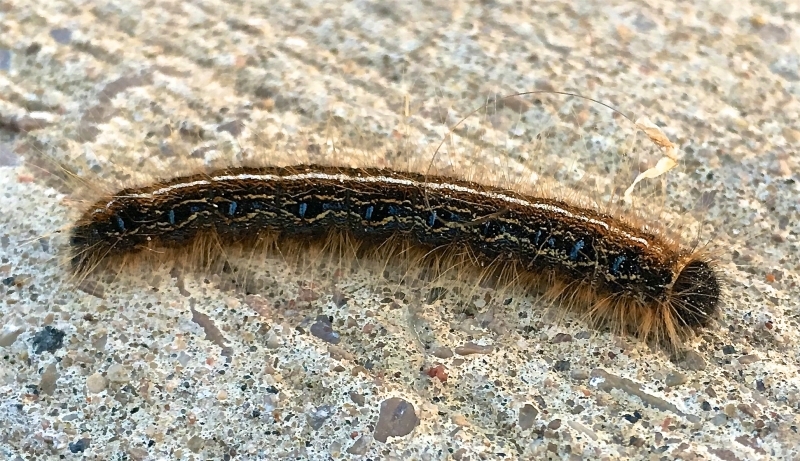 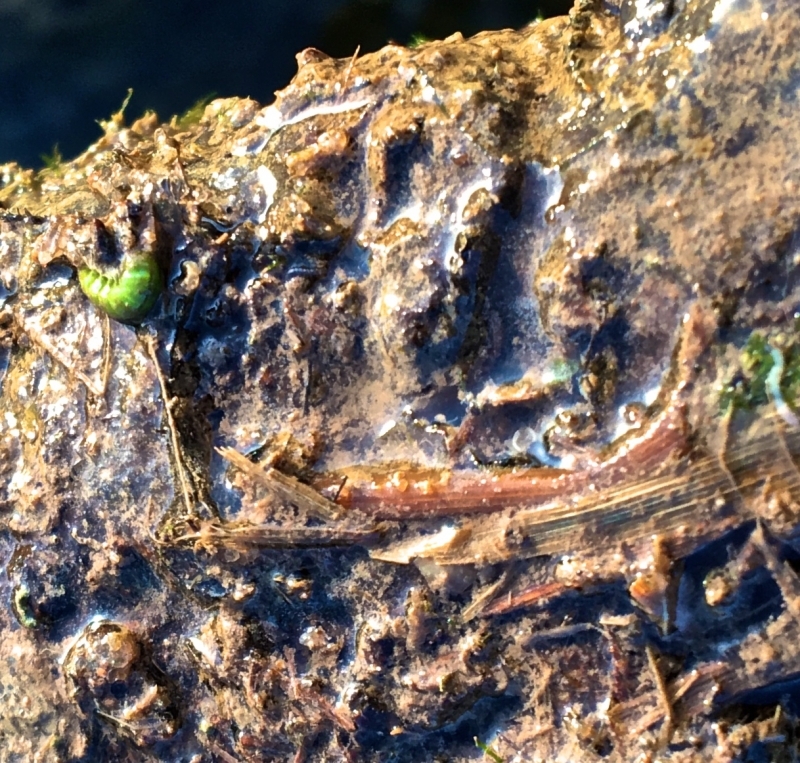 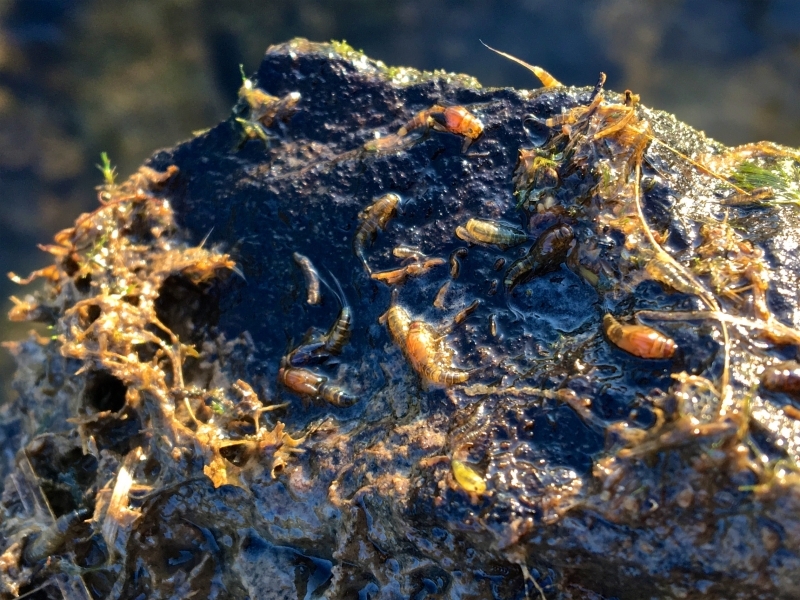 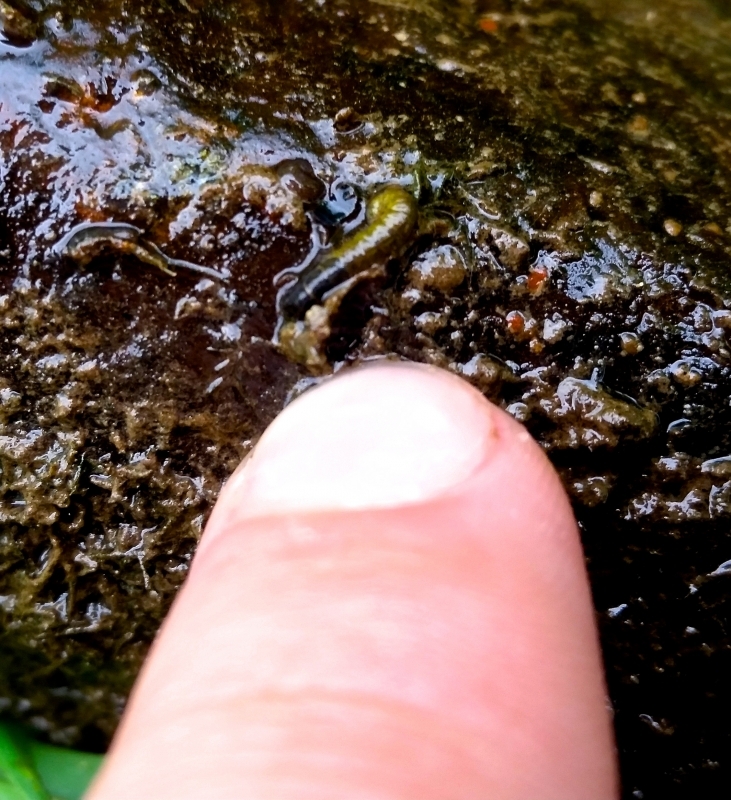 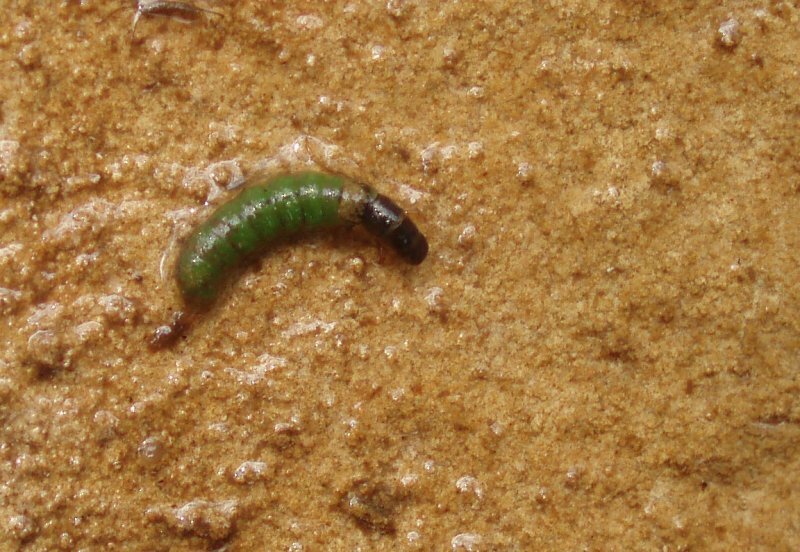 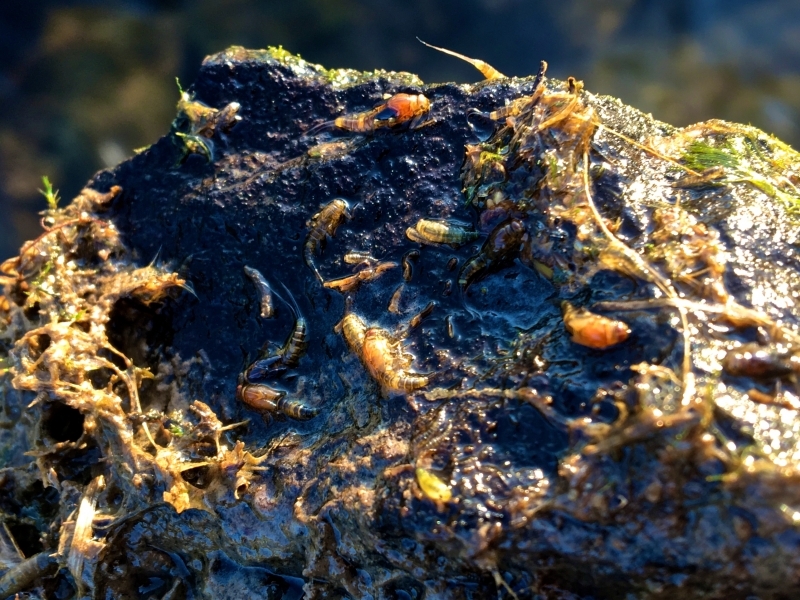 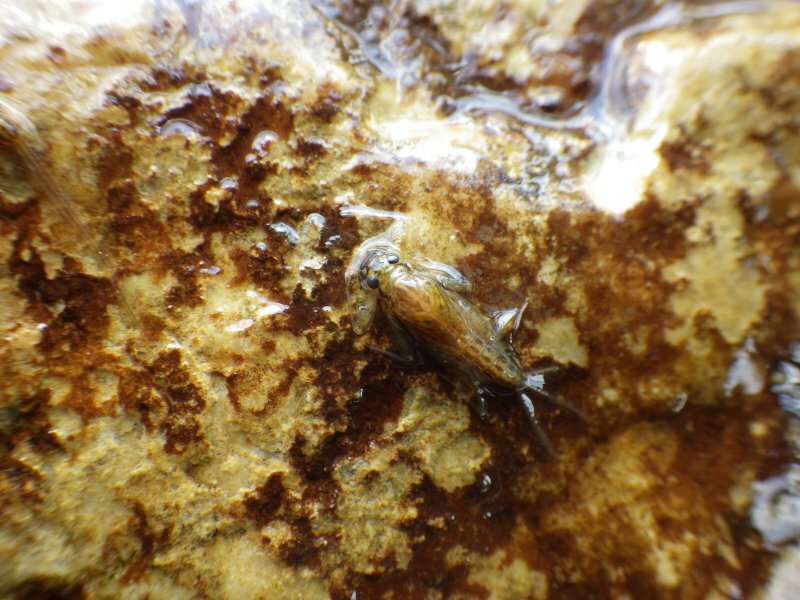 A Hydropsyche Caddis Larva on the Grand River. 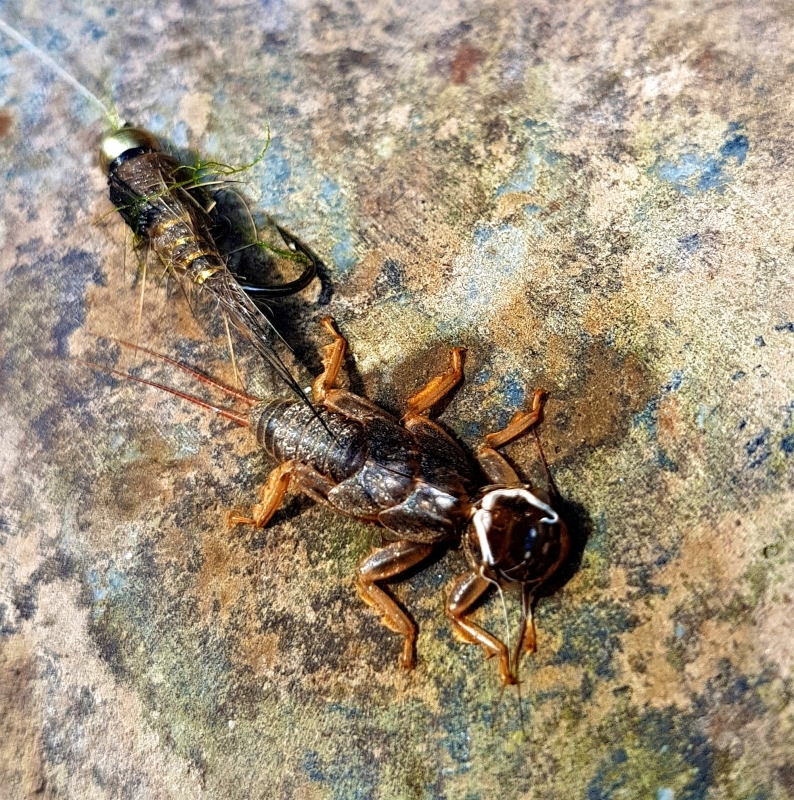 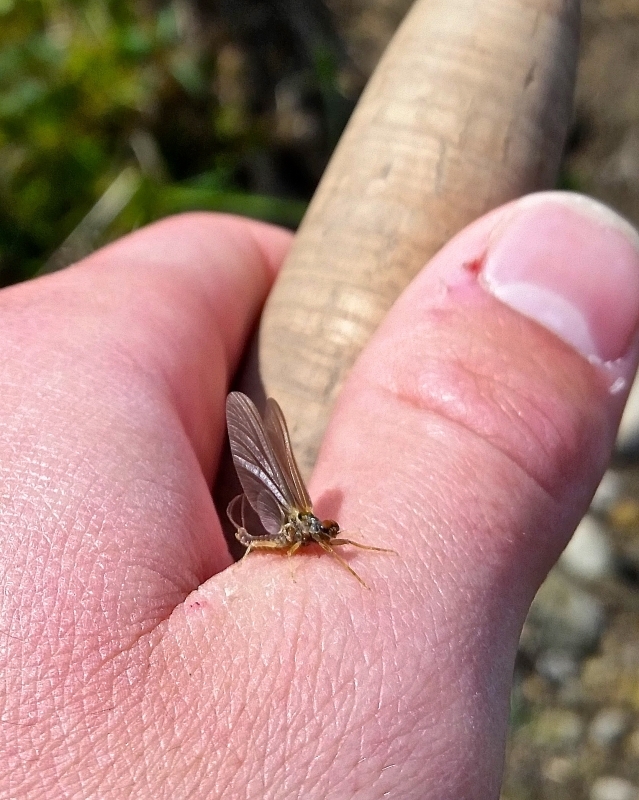 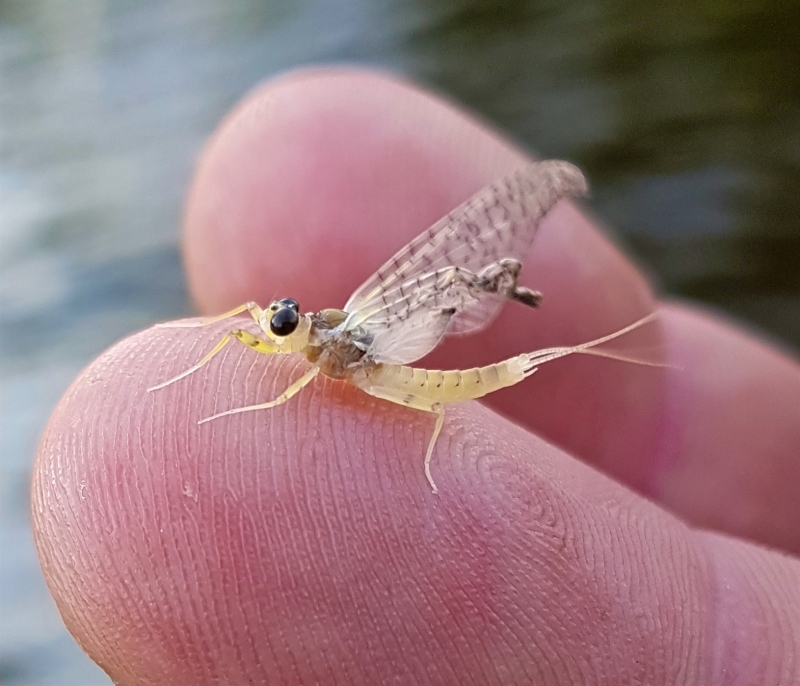 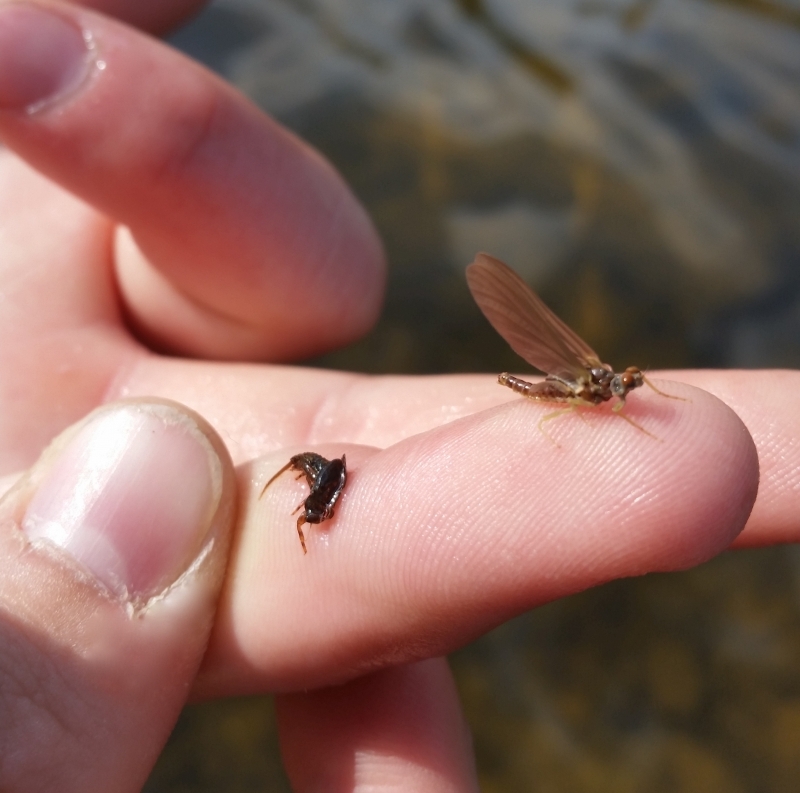 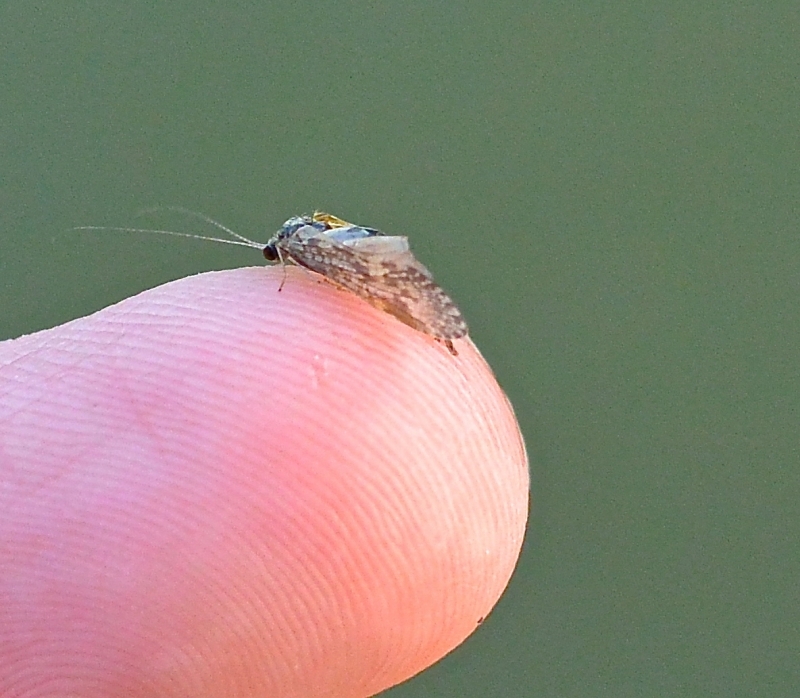 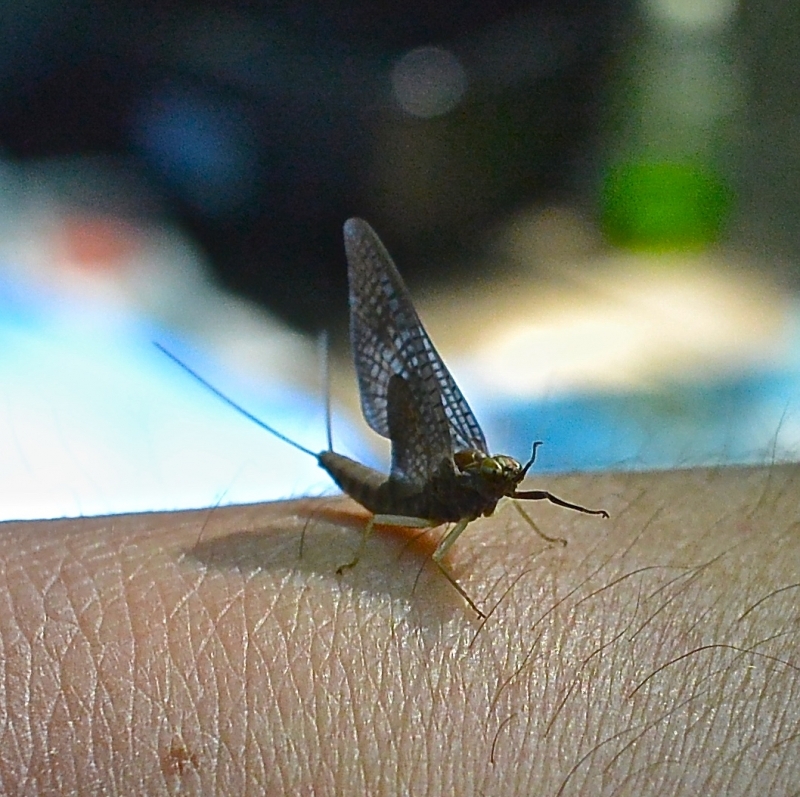 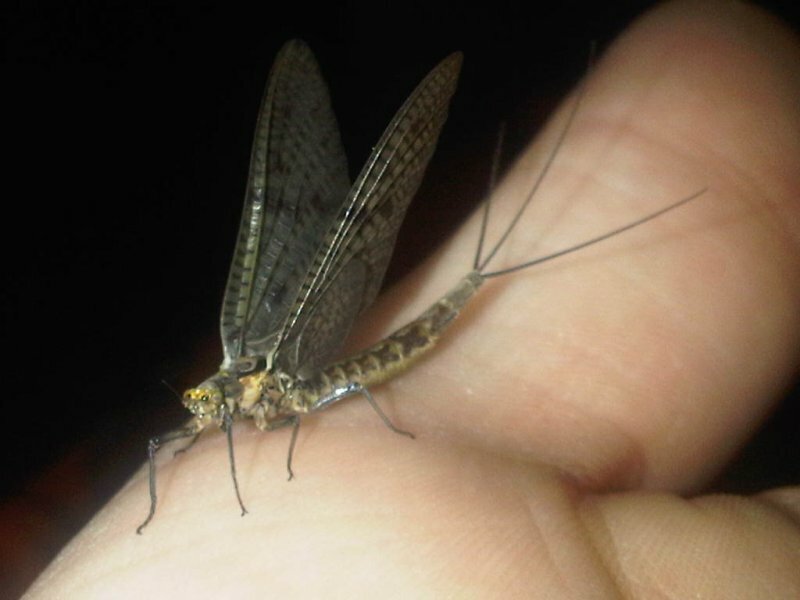 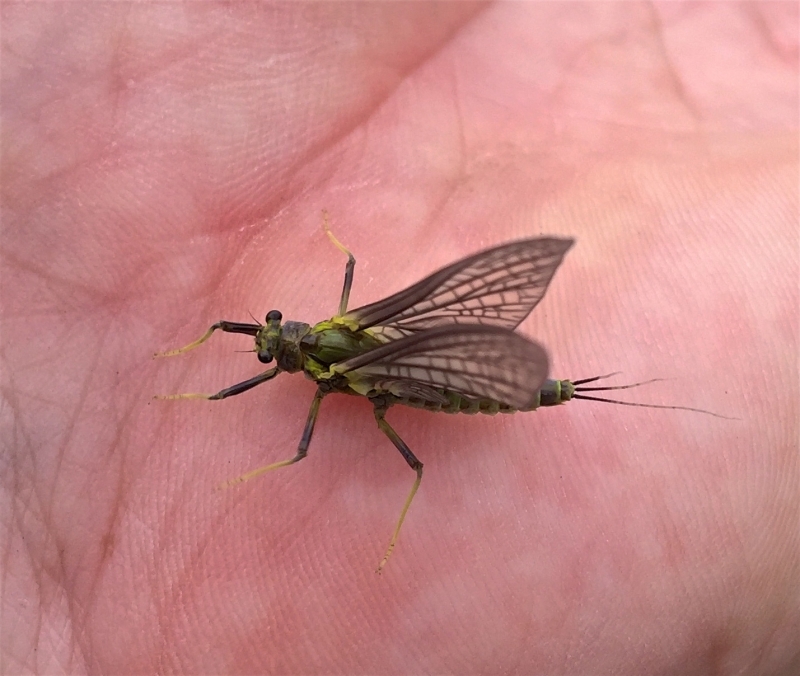 A Upper Credit River Coffin Fly. 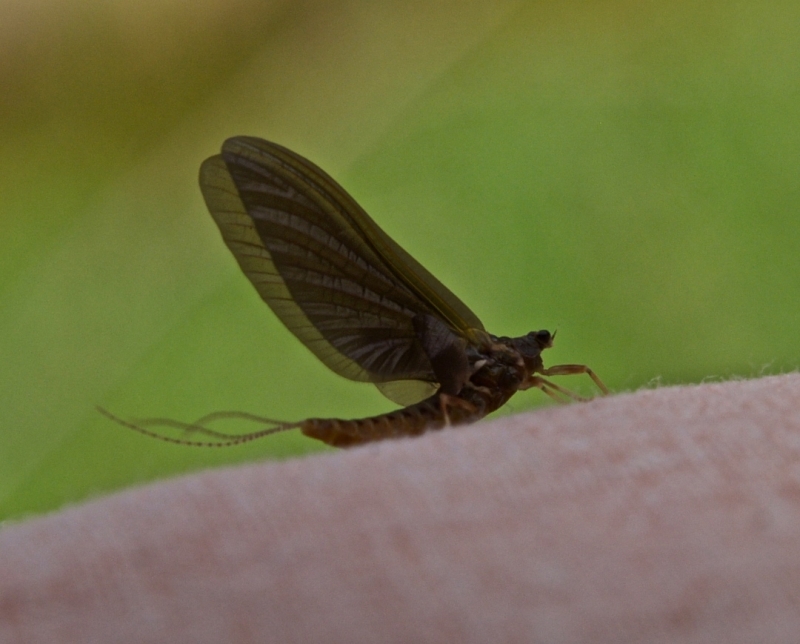 A Light Cahill Fly sunning itself in a Fly Box on the Grand River. 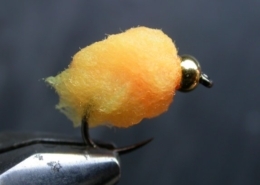 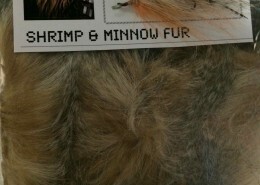 A Upper Grand River Fox Dun. 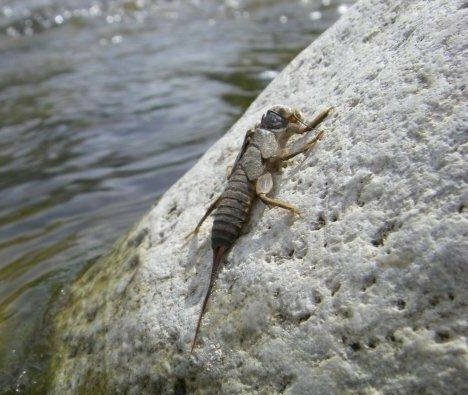 Upper Grand River Grand River Fox. 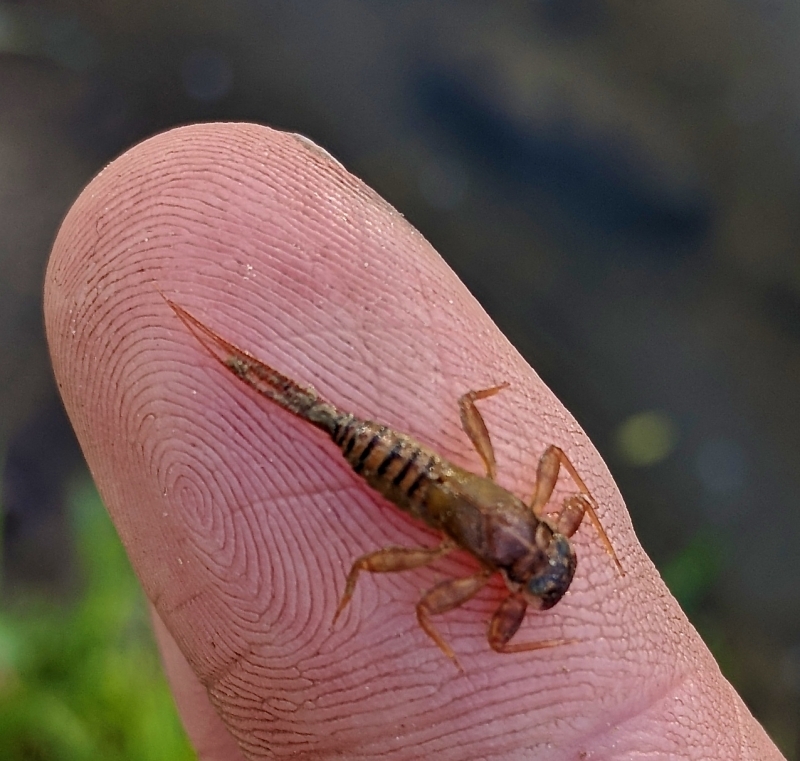 A Fox Dun on the Grand River. 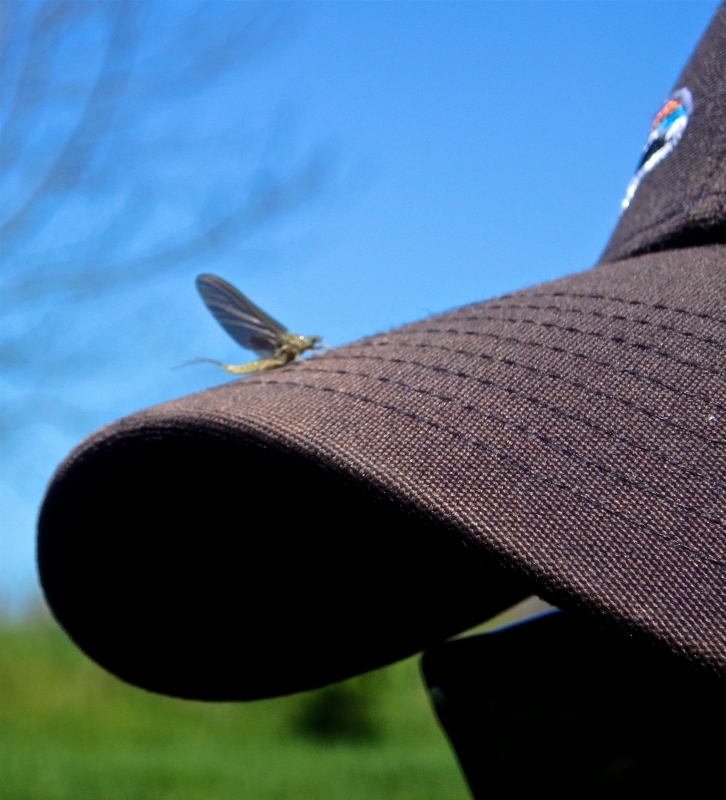 A Upper Grand River Fox on Ball Cap. 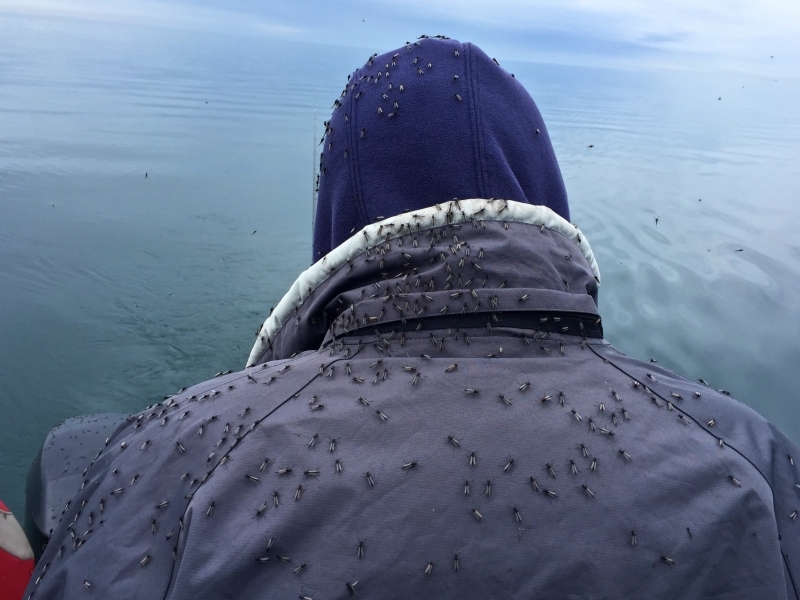 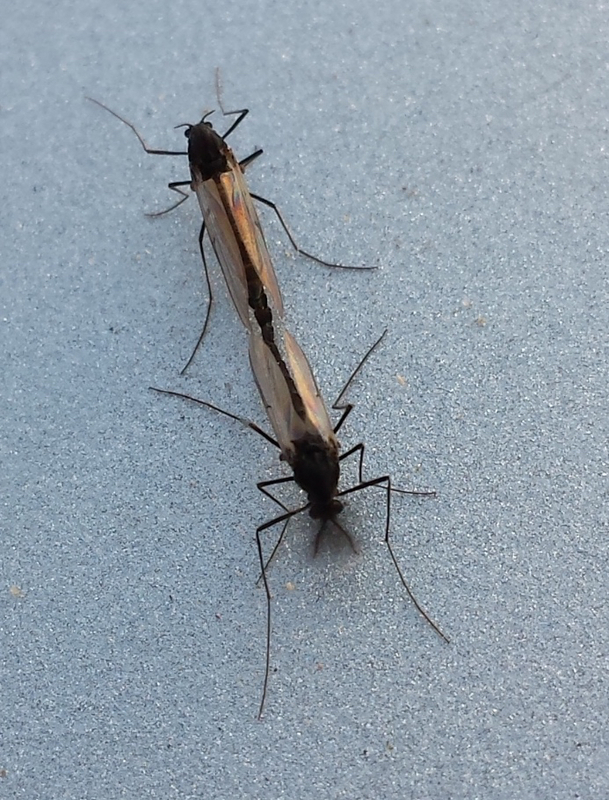 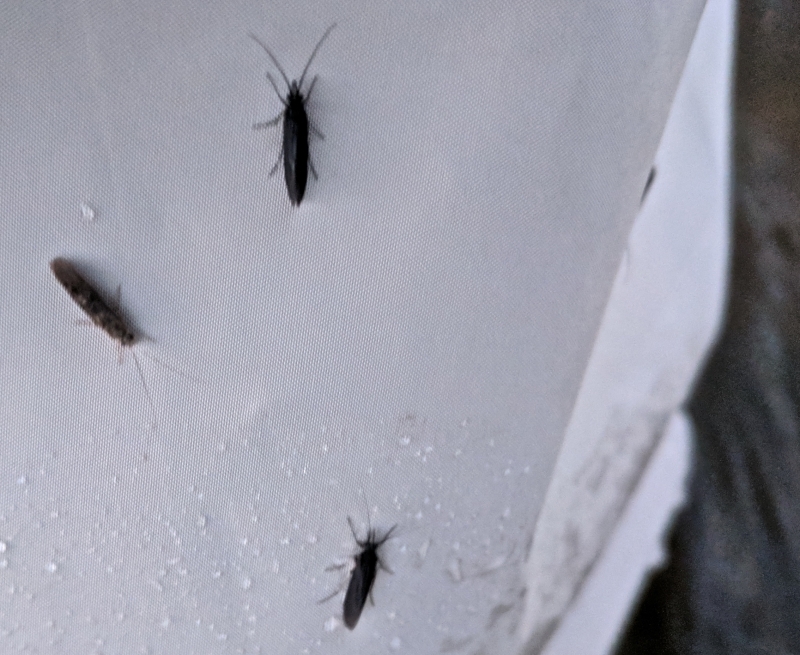 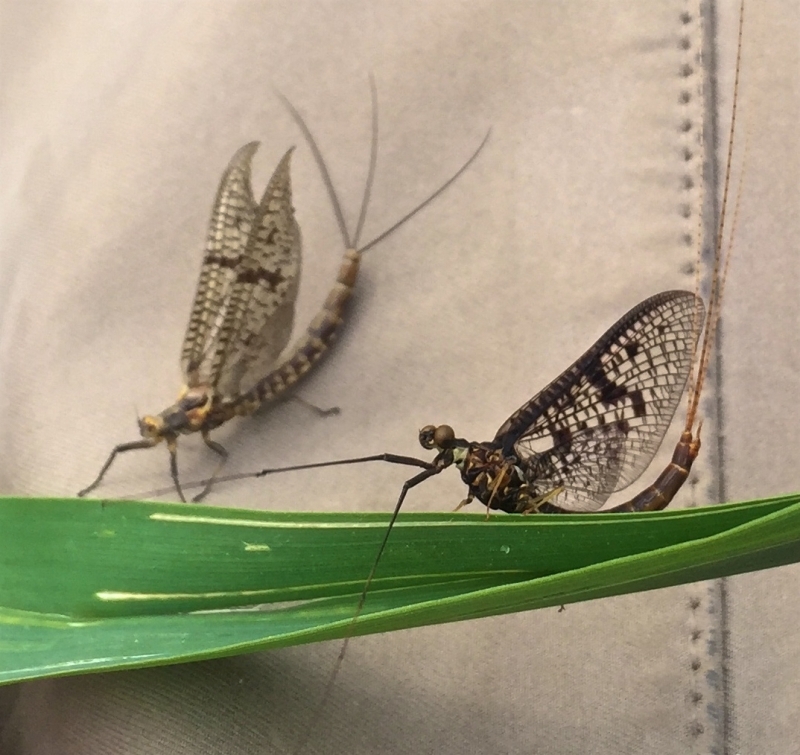 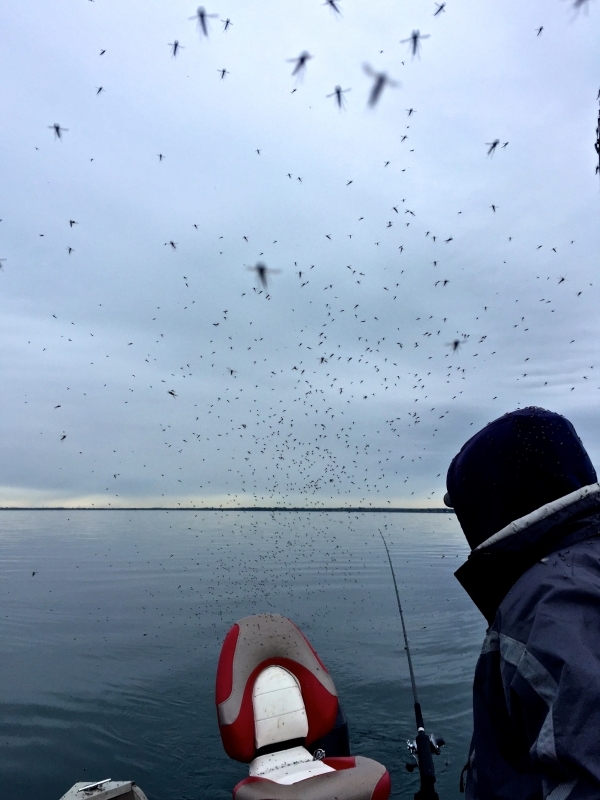 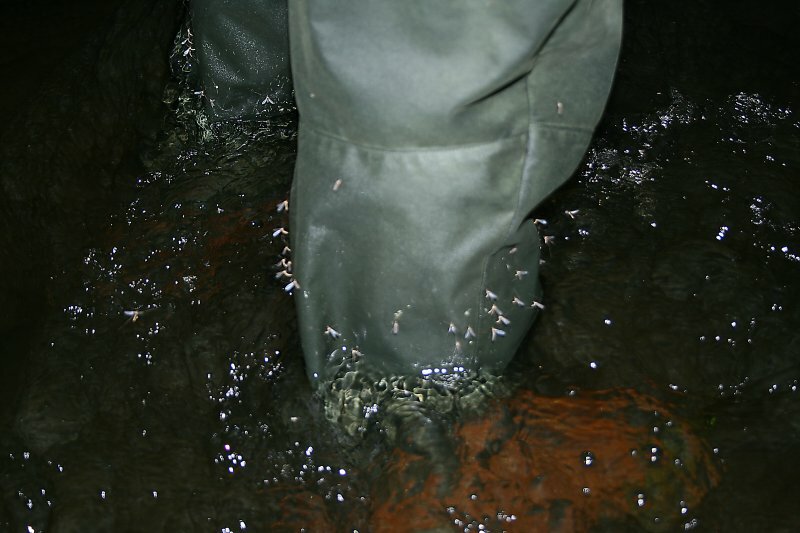 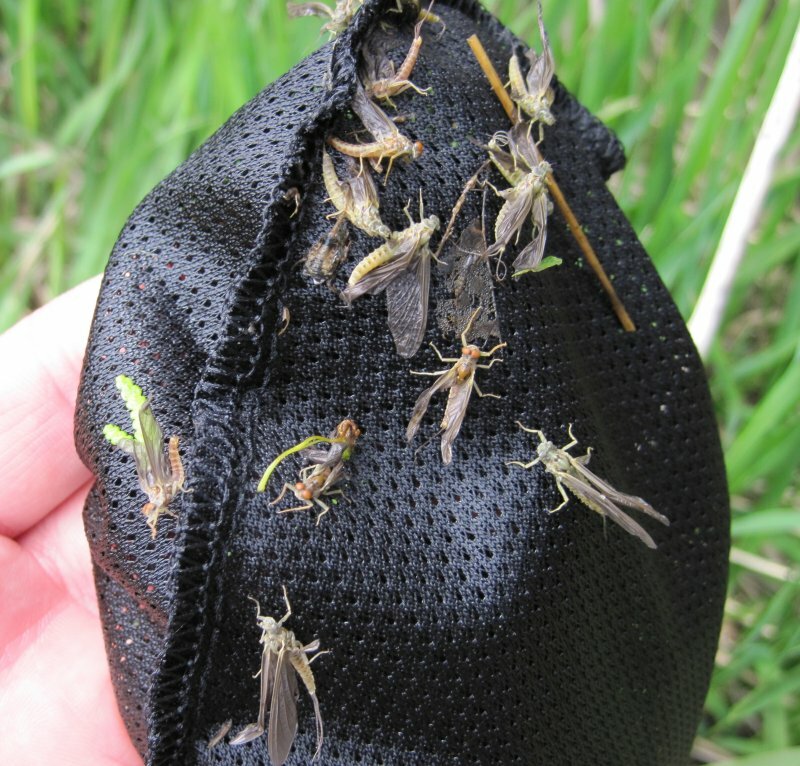 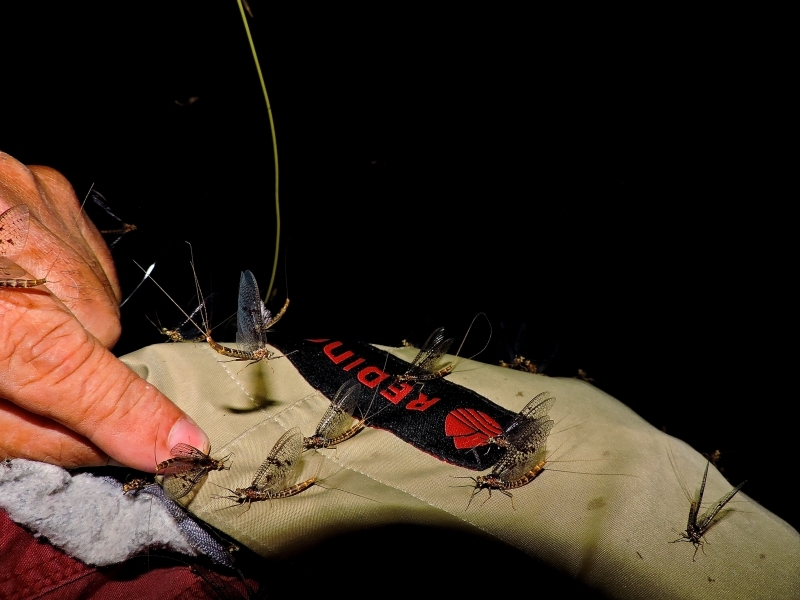 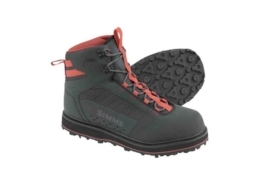 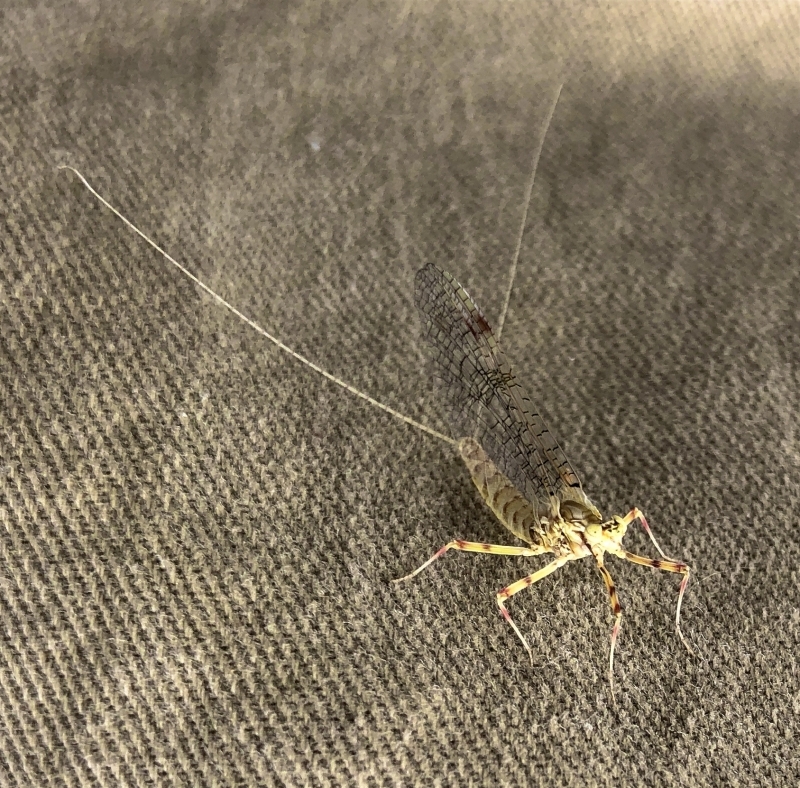 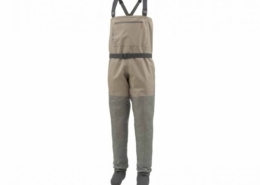 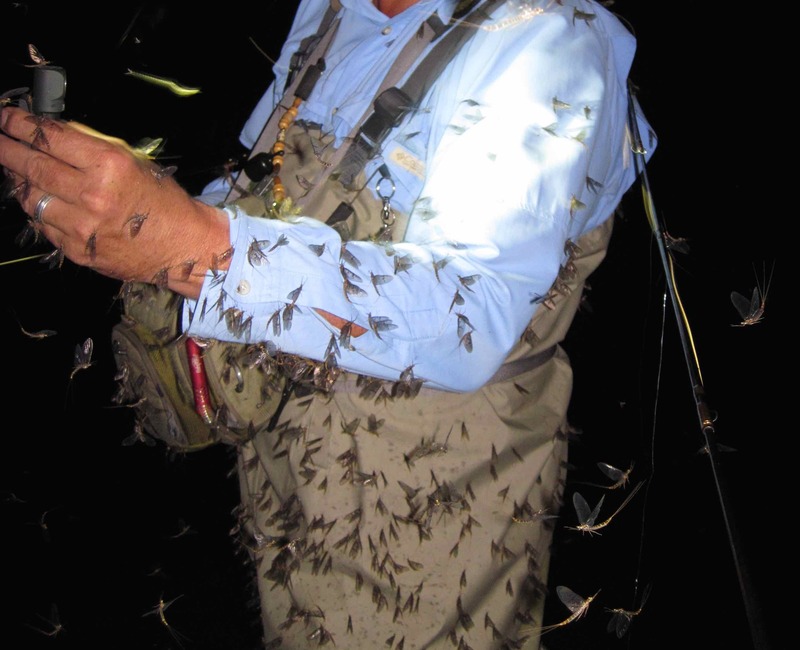 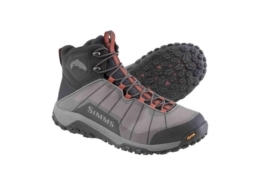 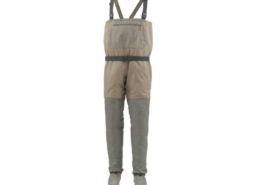 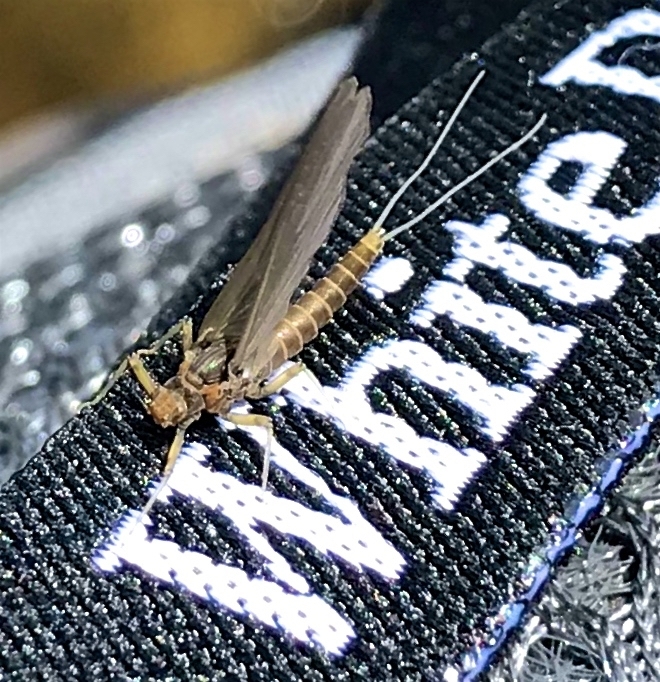 Craneflies on a pair of Simms Waders while wading on the Grand River. 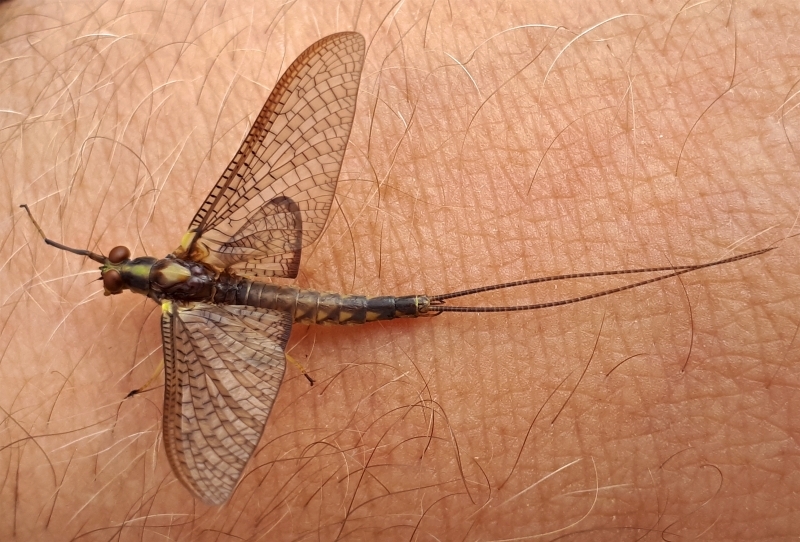 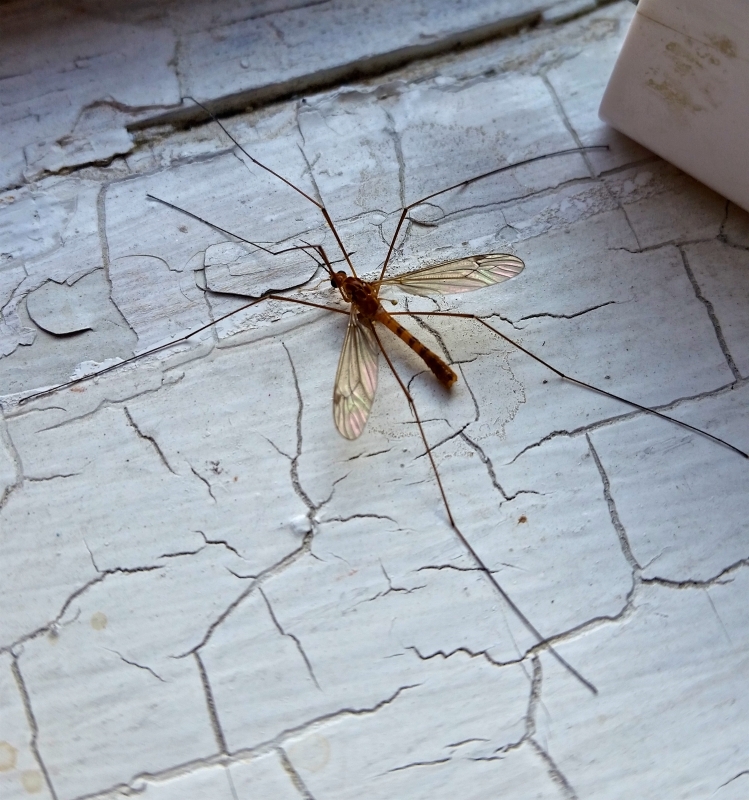 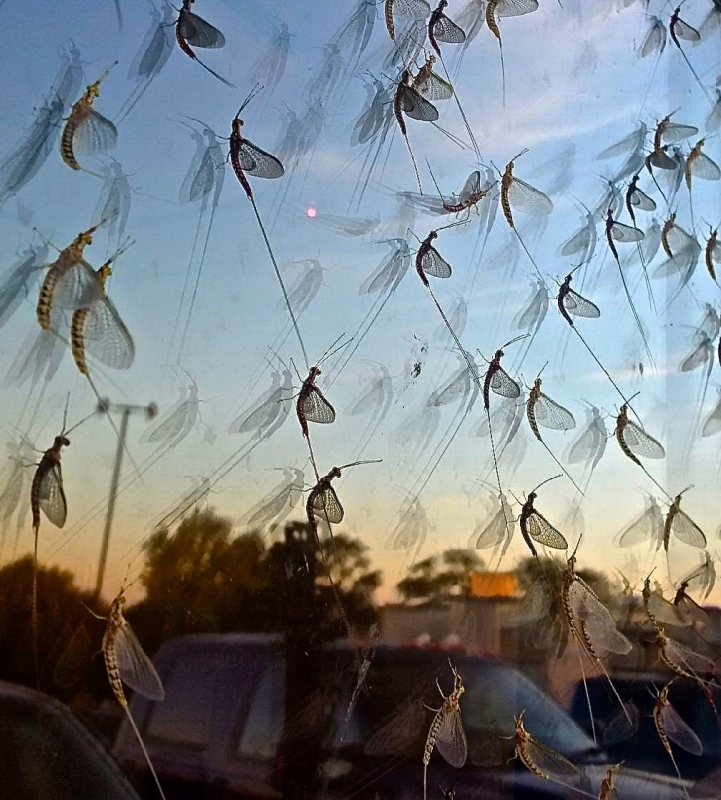 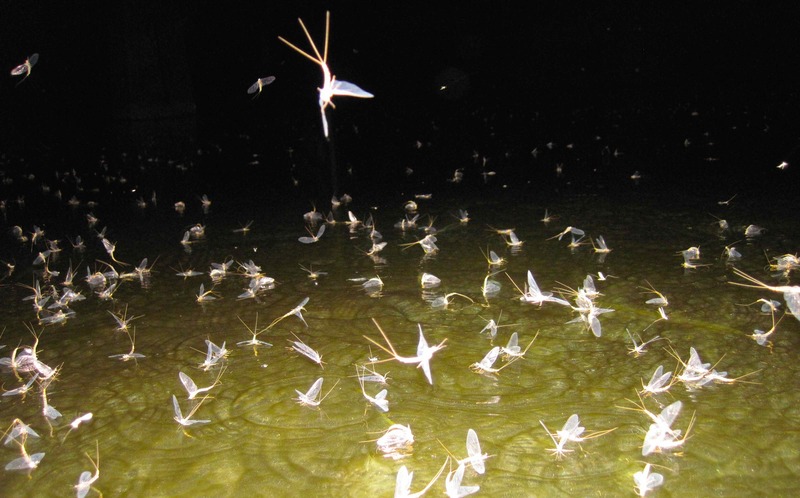 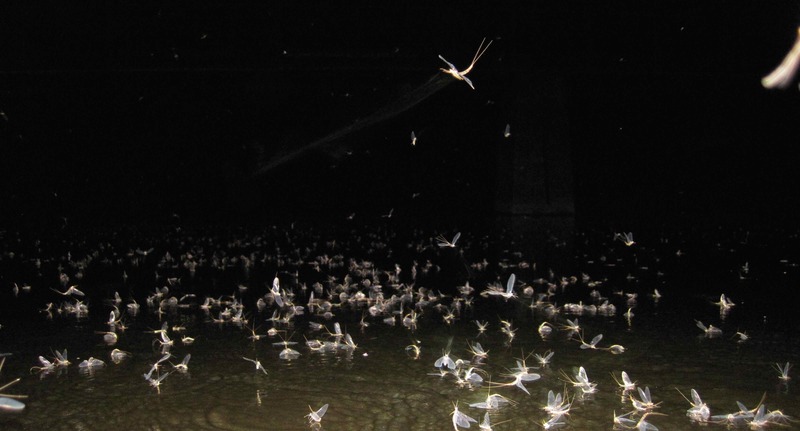 Crane Flies on the Grand River. 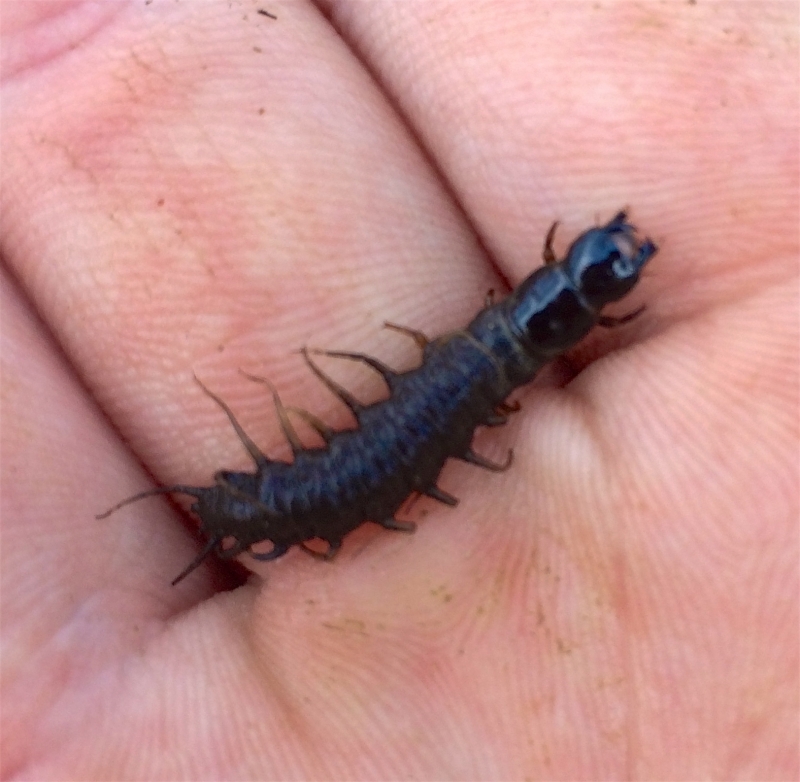 A Isopod from the Grand River below Shand Dam. 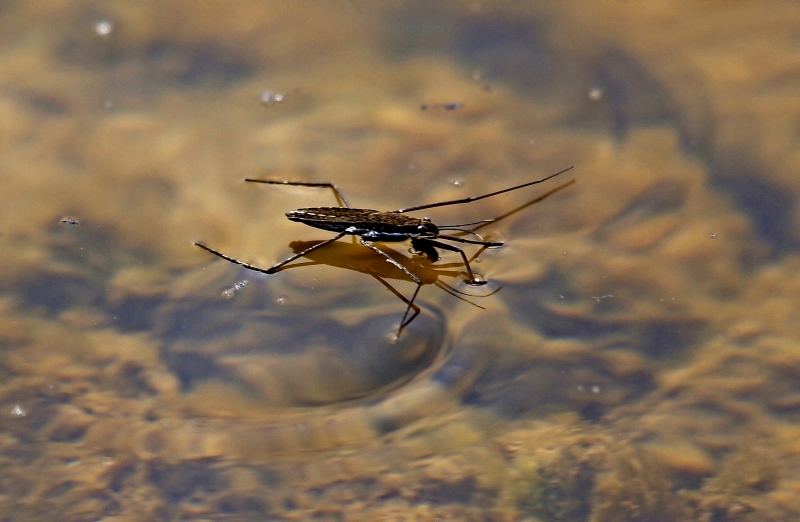 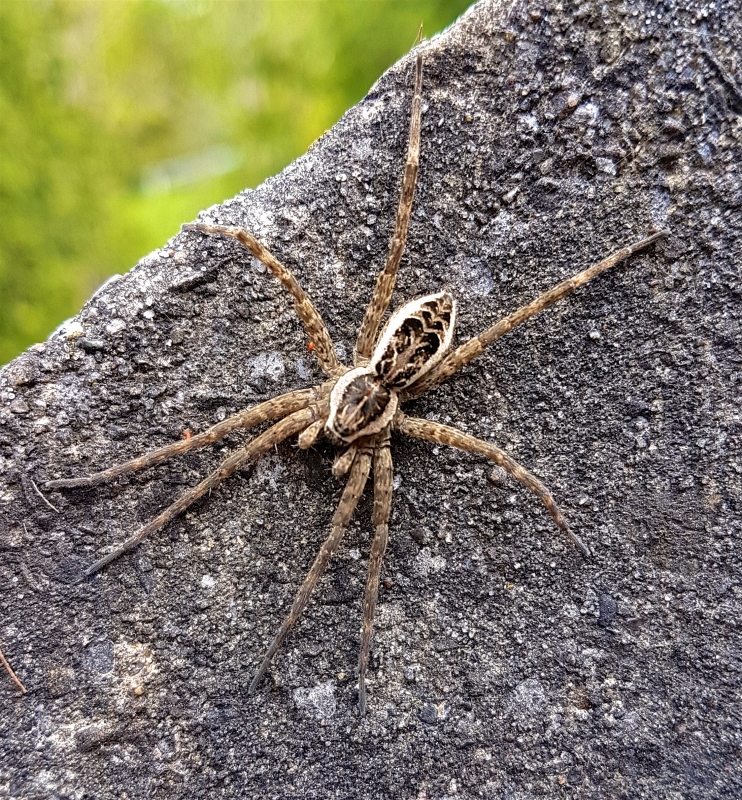 Water Spider - The Upper Grand River. 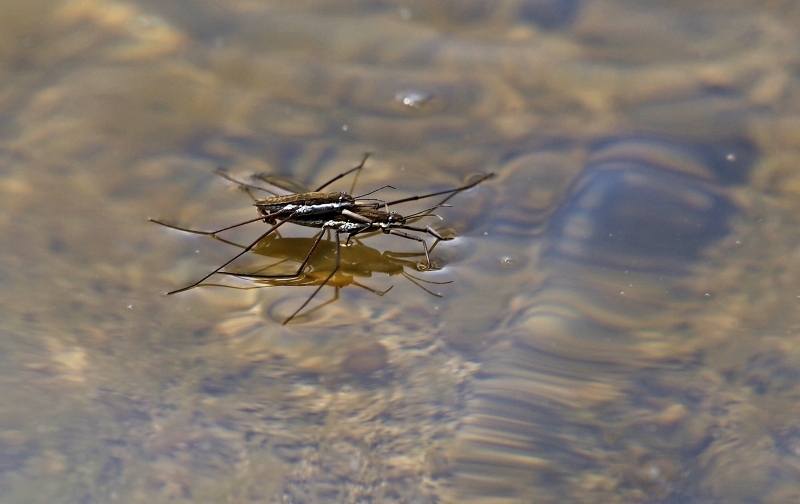 Water Spider Pair - The Upper Grand River. 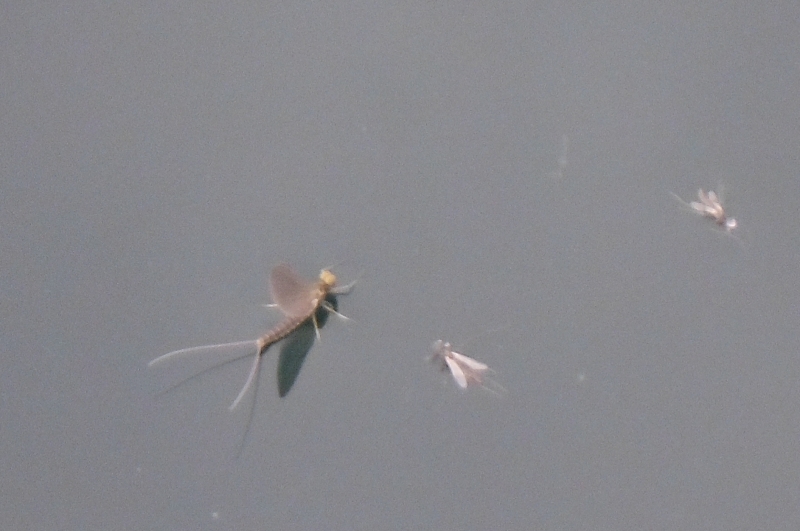 Shades Mills - Mill Creek - Hexagenia. 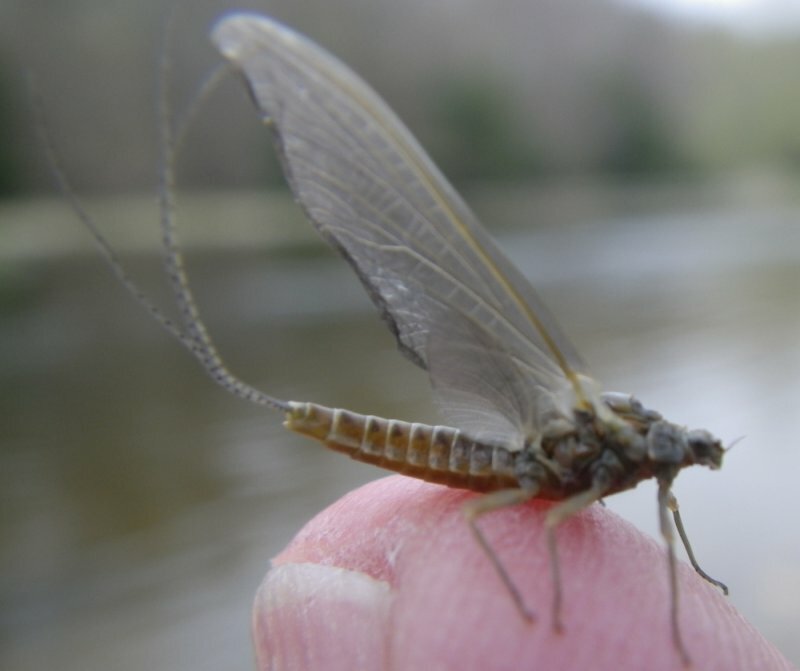 A Brown Drake Dun on the Grand River. 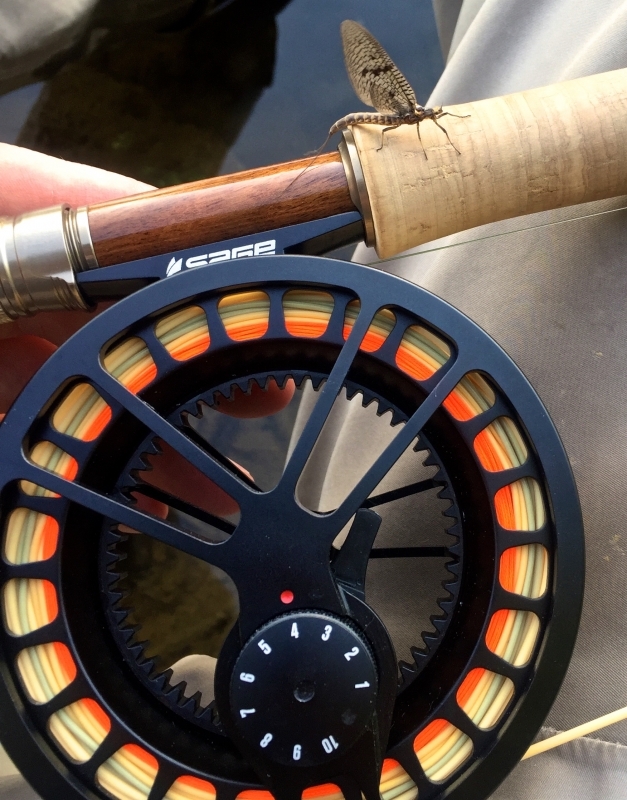 A Grand River Brown Drake Spinner. 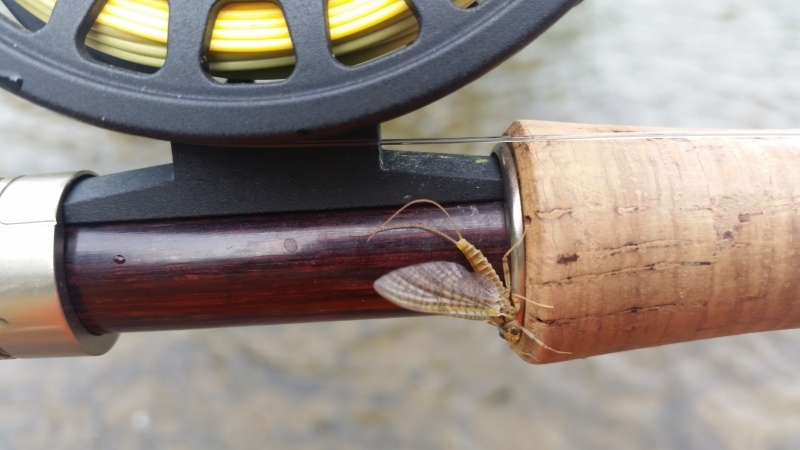 A Grand River Brown Drake Shuck. 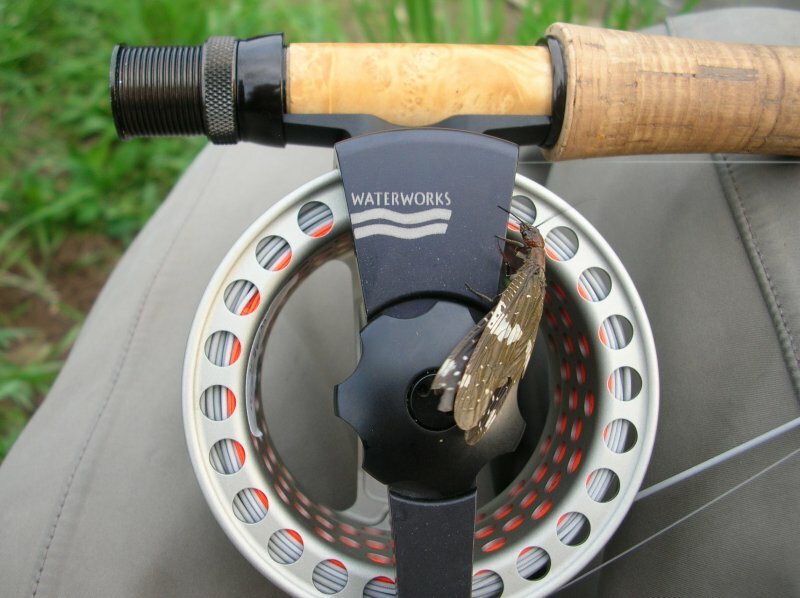 A Grand River BWO & Trico on a Spider Web. 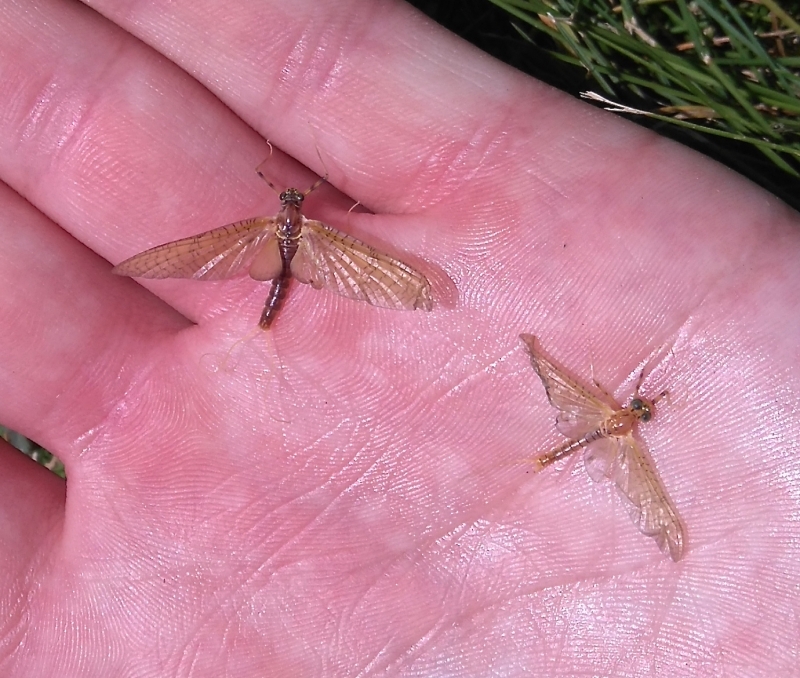 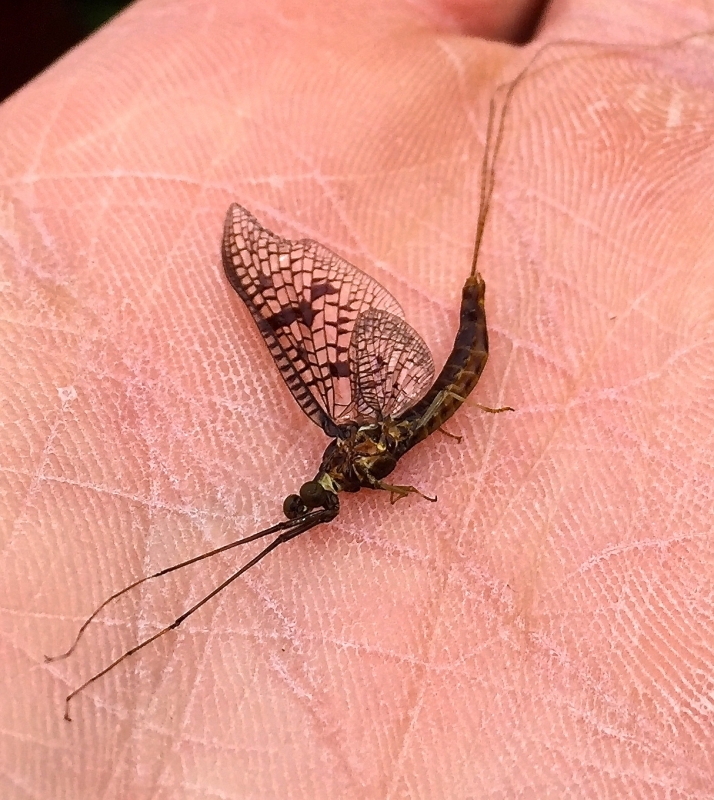 Caddis Eggs on a pair of Simms Waders while on the Grand River. 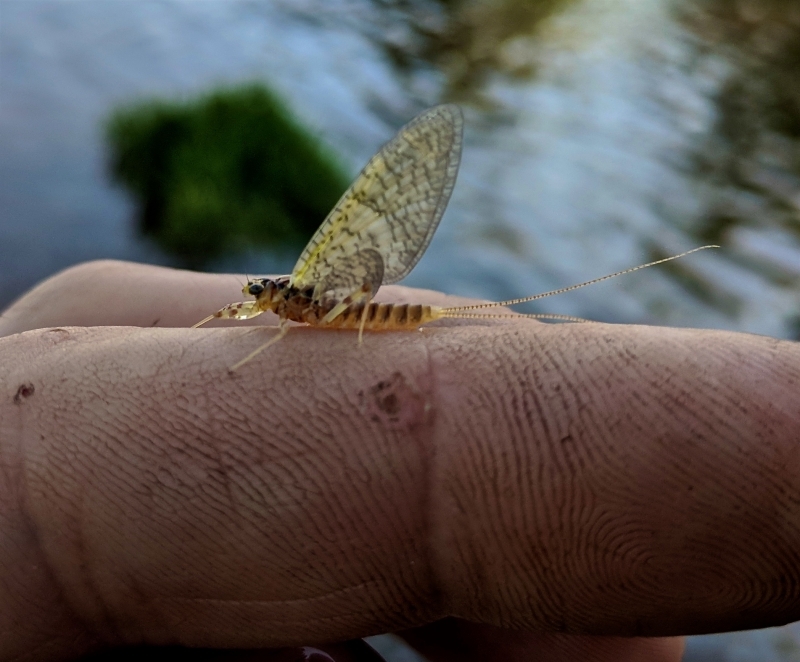 Caddis on a pair of Simms Waders while on the Grand River. 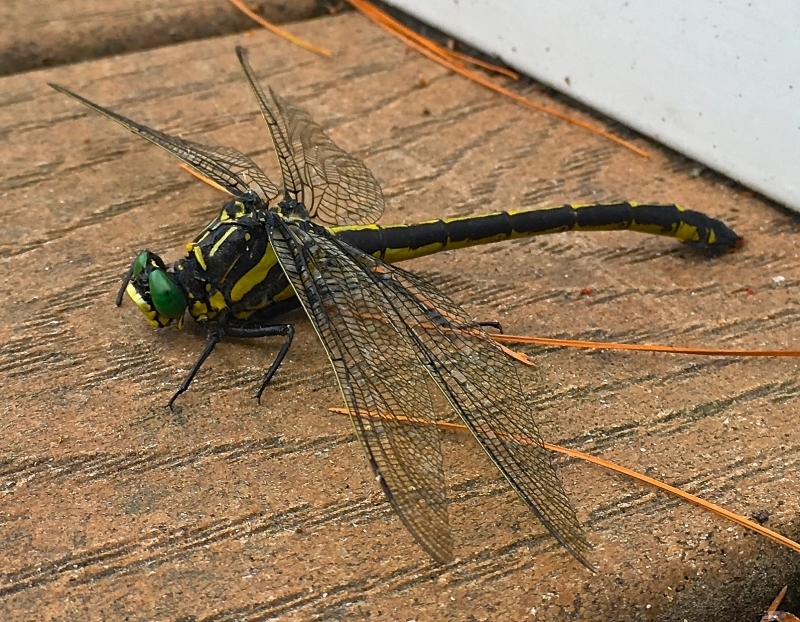 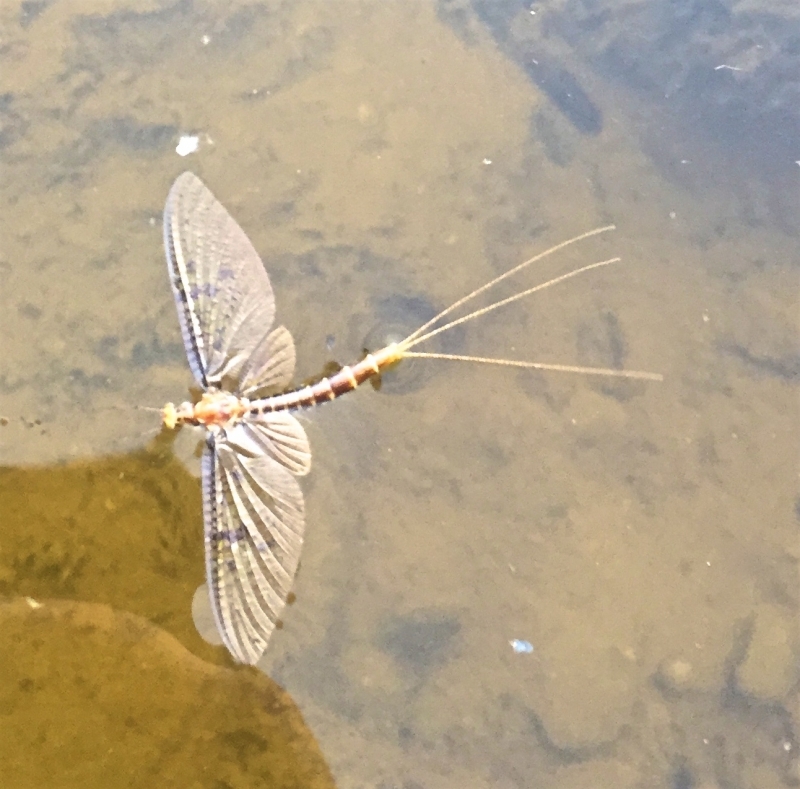 A Drake Spinner on the Grand River. 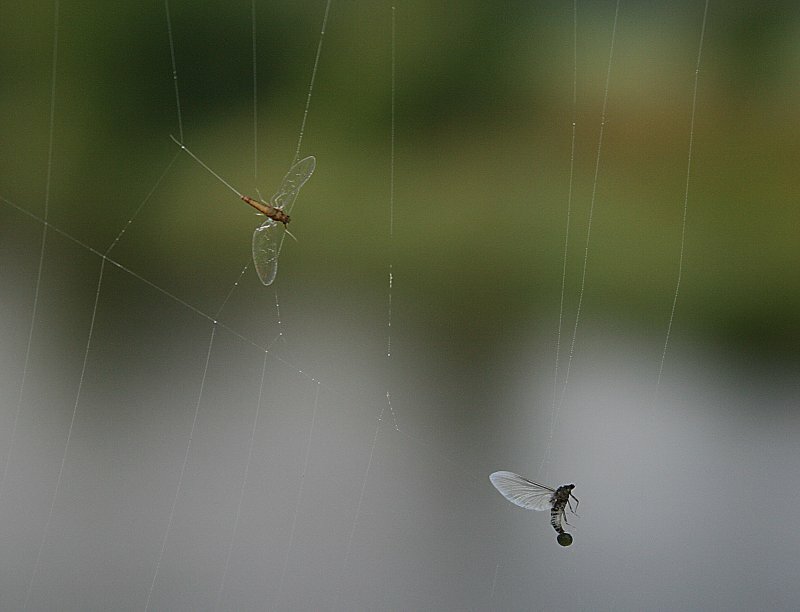 Tricos on a Bridge Spider Web on the Grand River. 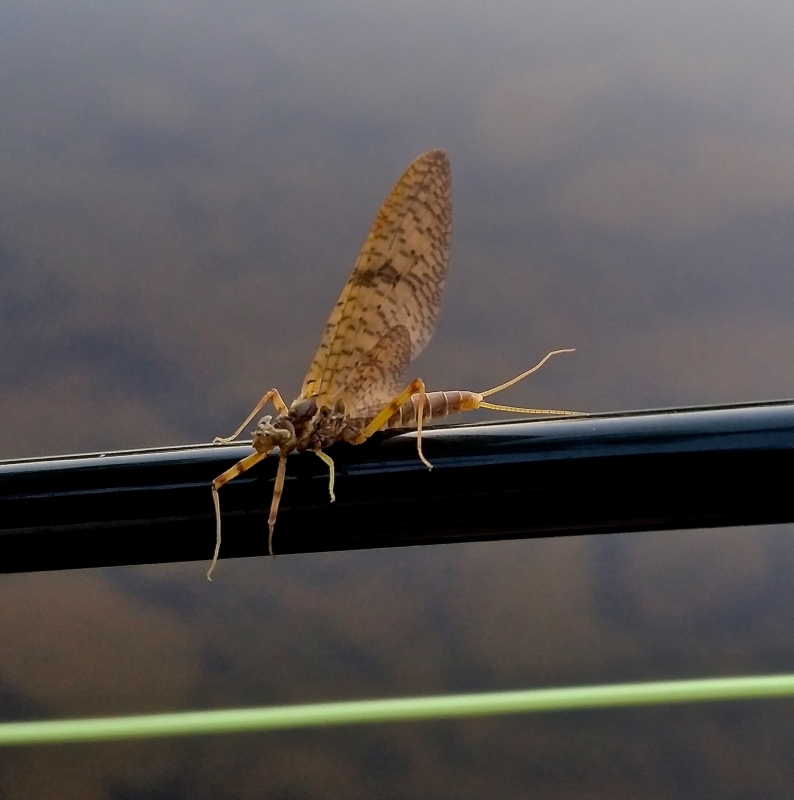 Tricos in a Spider Web on the Grand River. 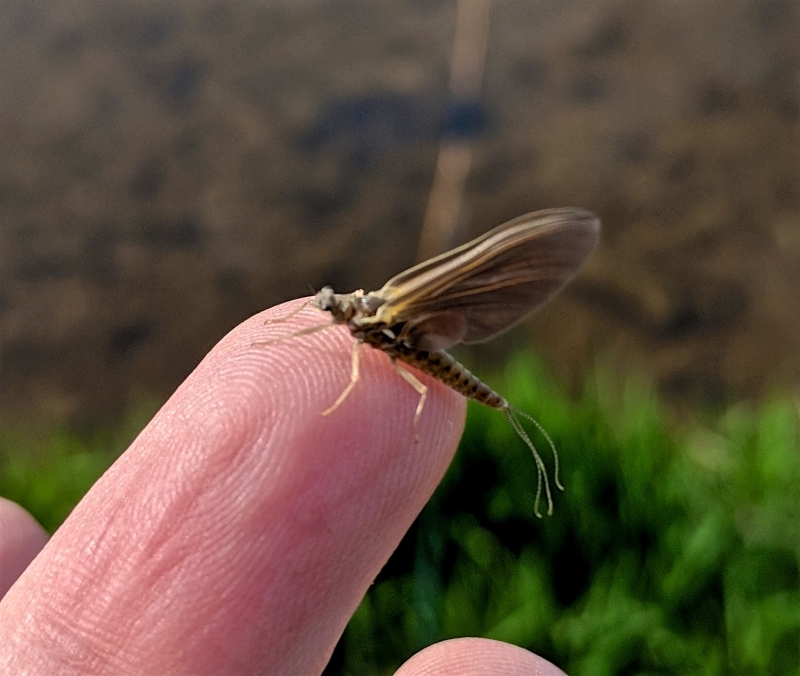 A Grand River Hendrickson on Finger. 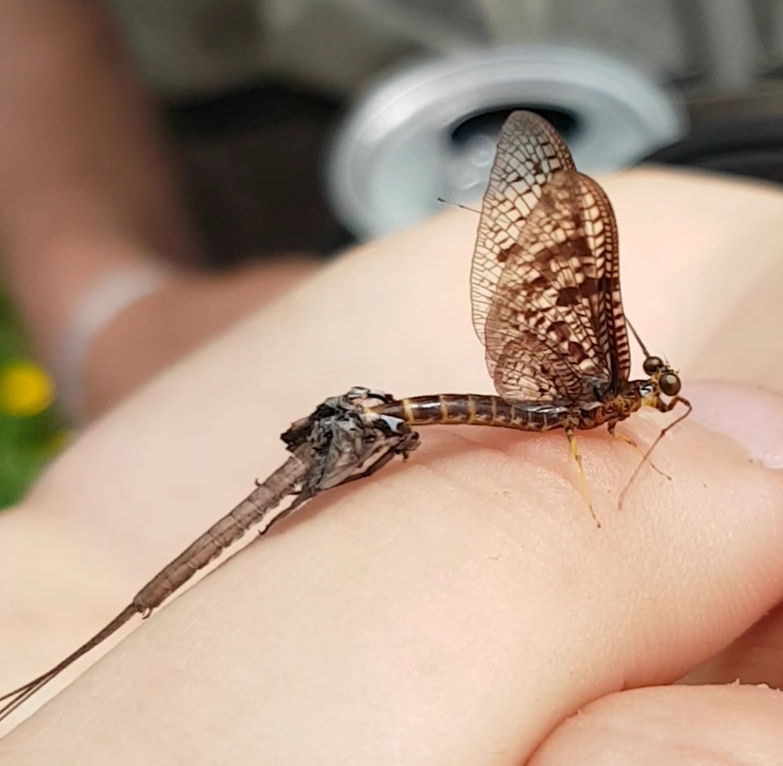 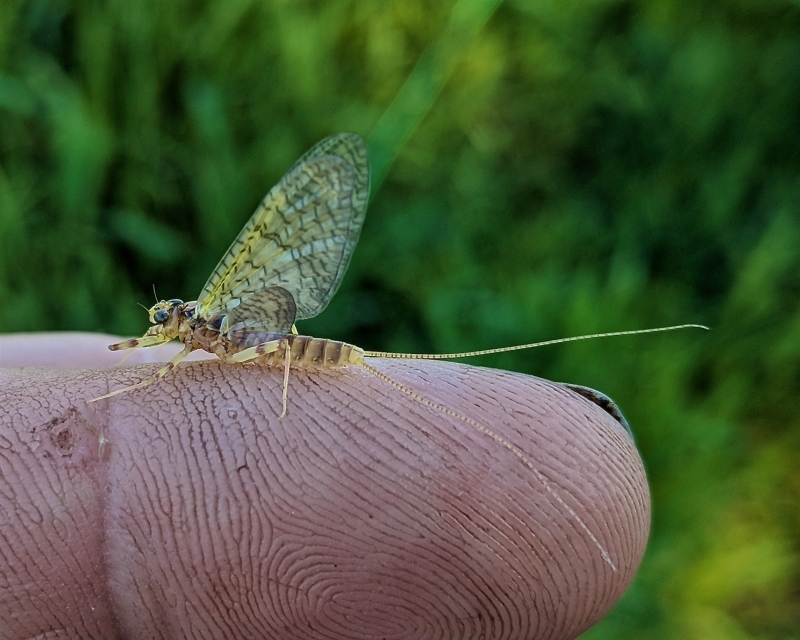 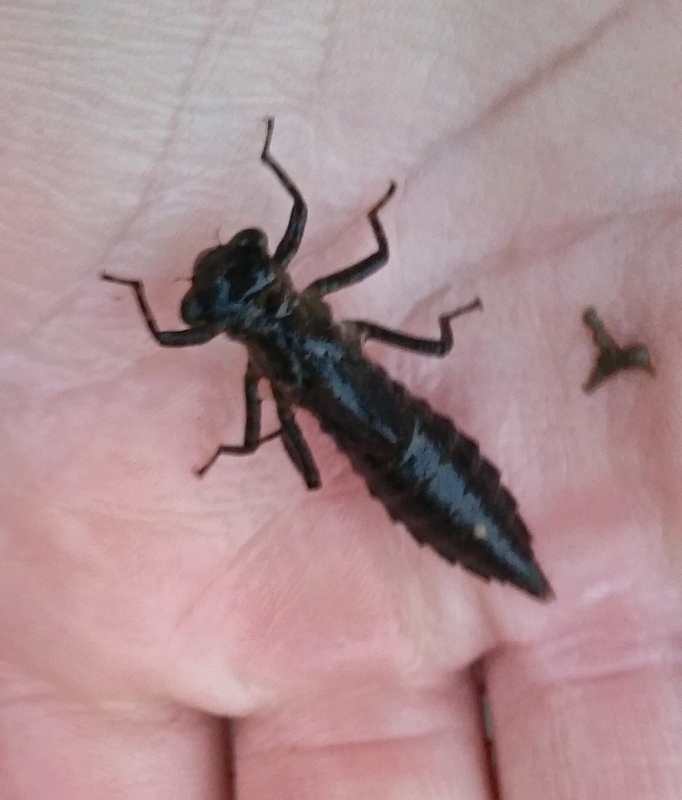 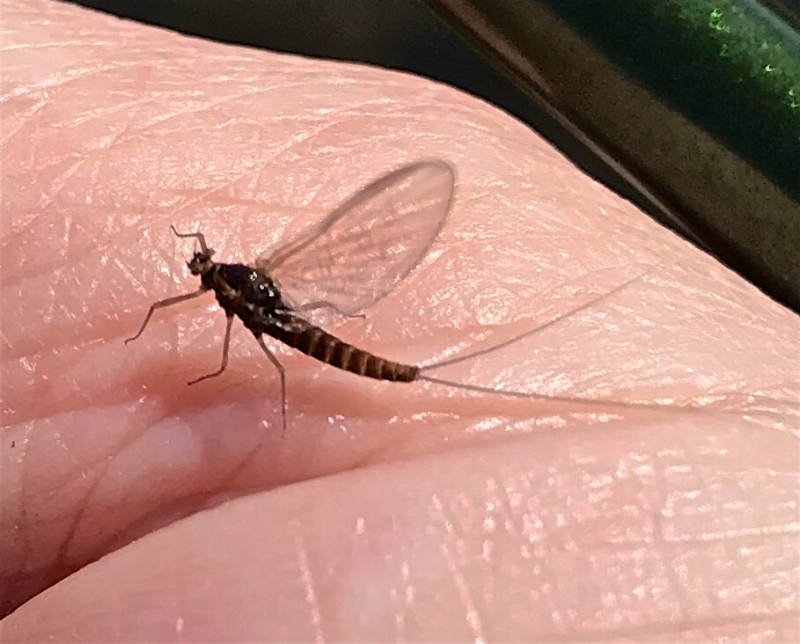 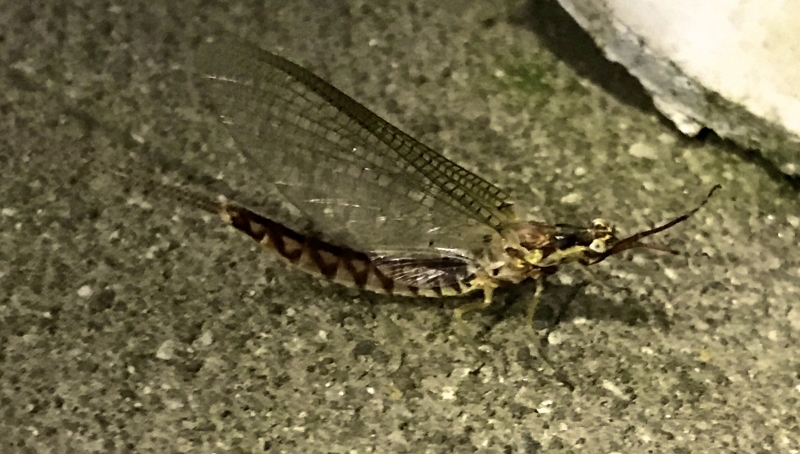 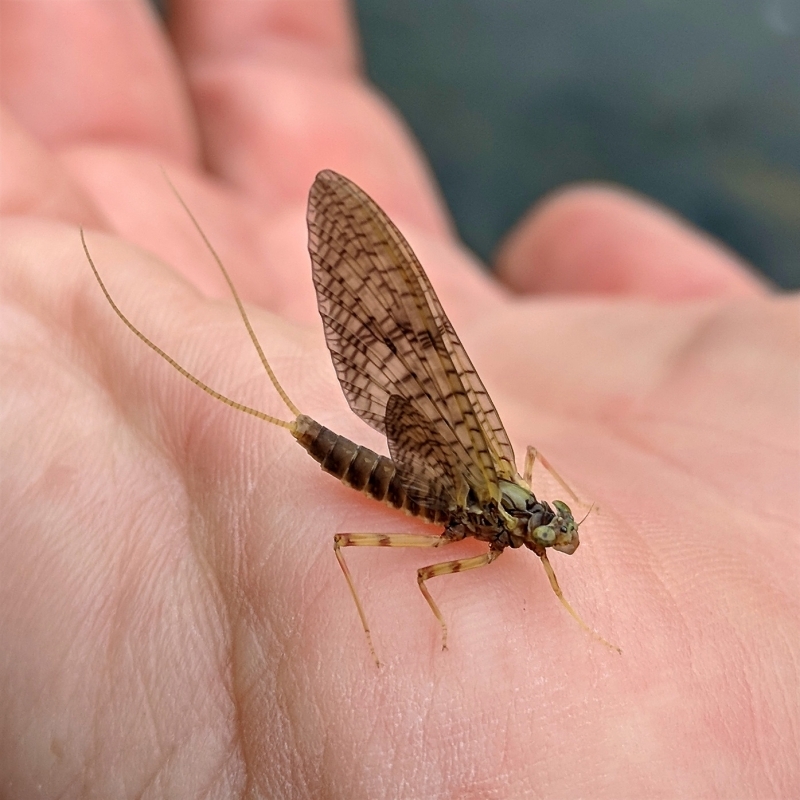 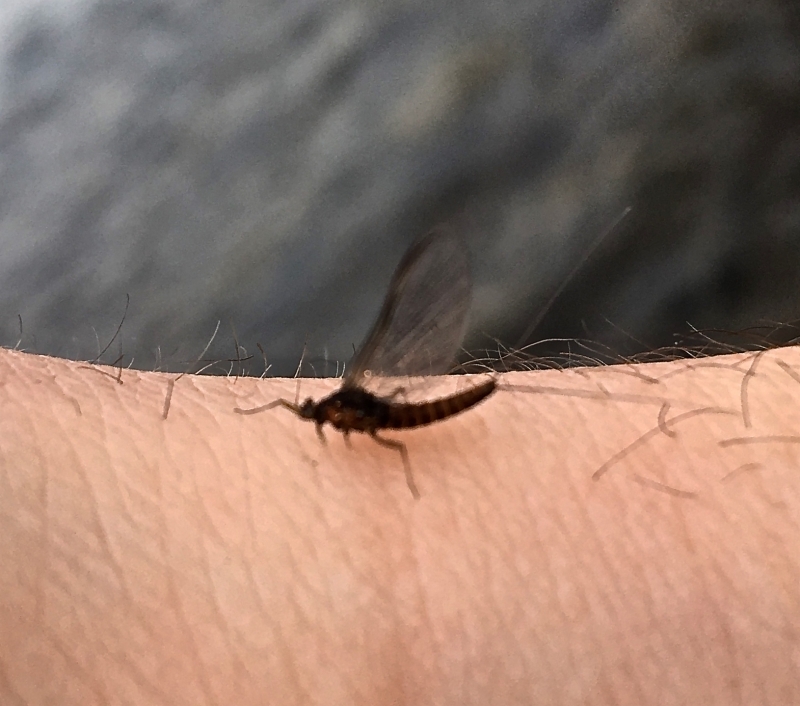 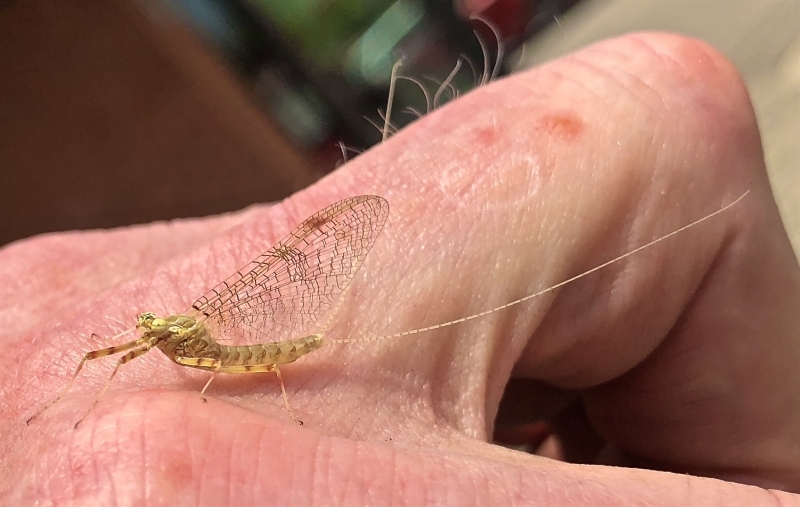 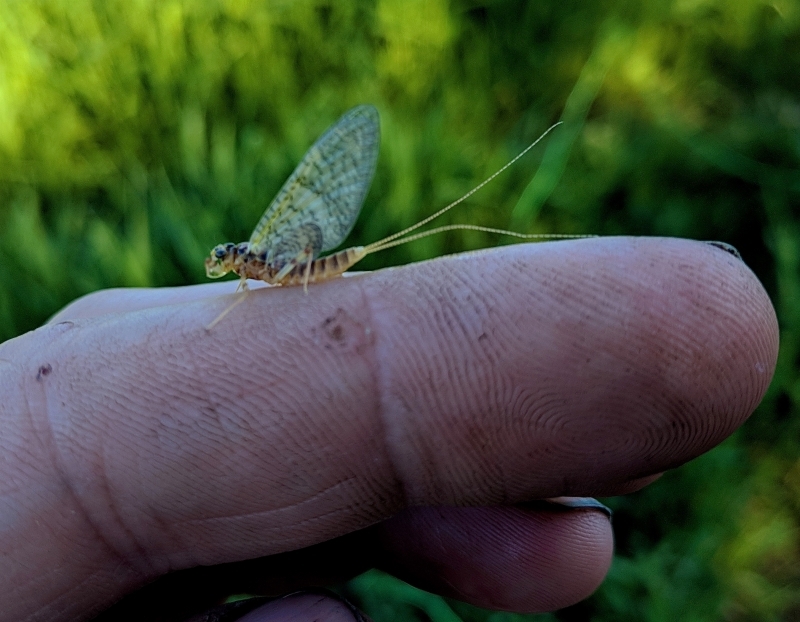 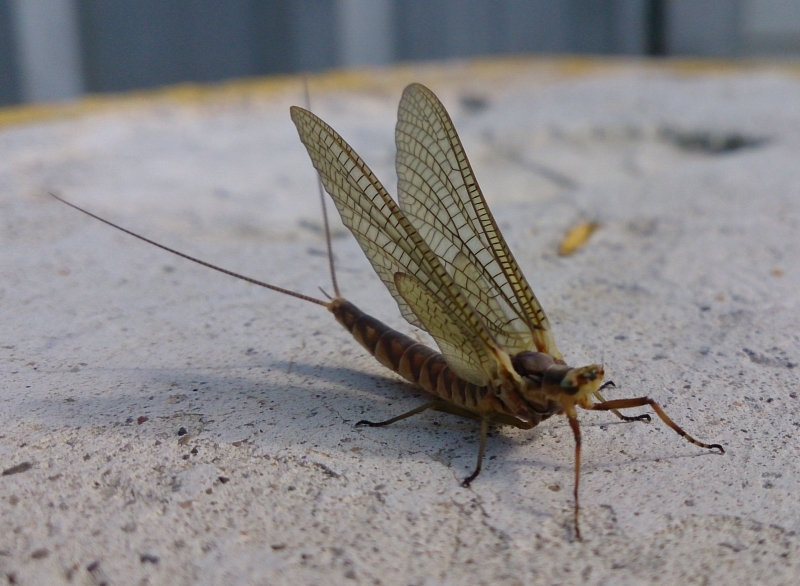 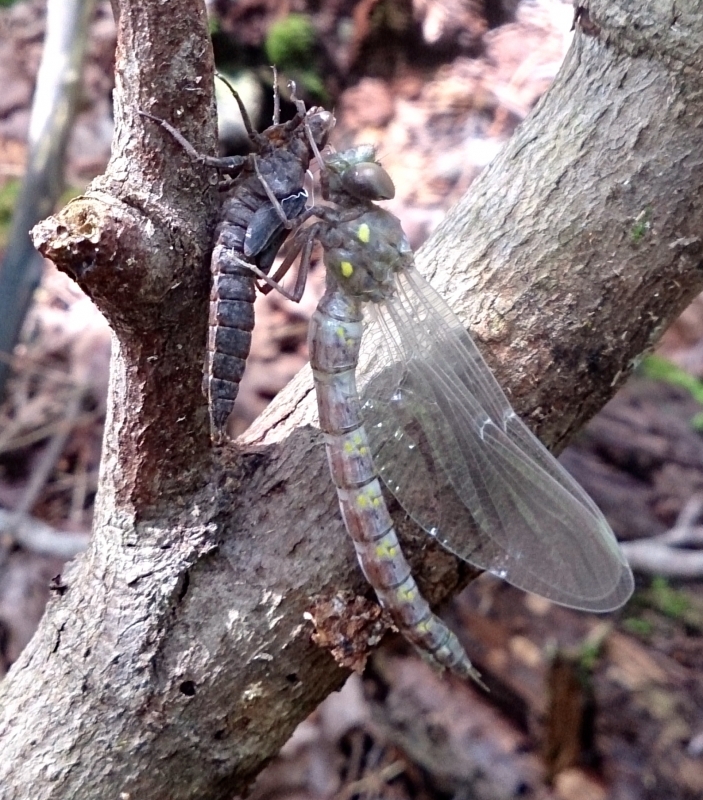 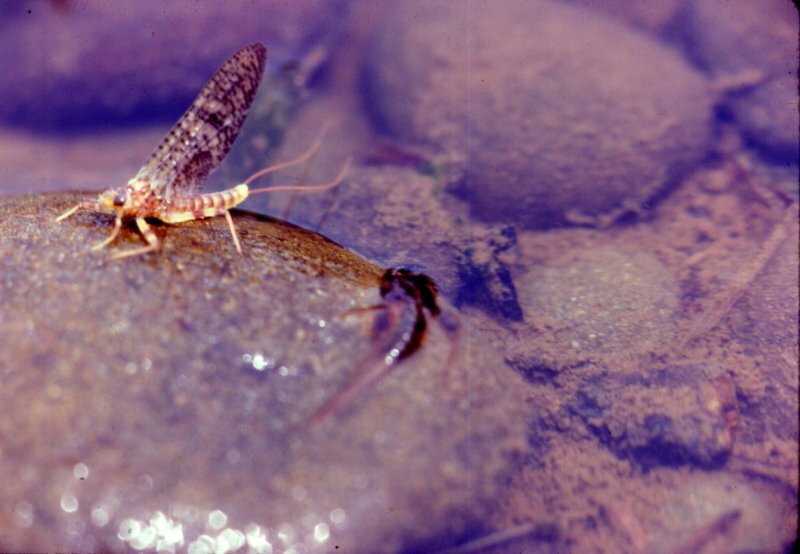 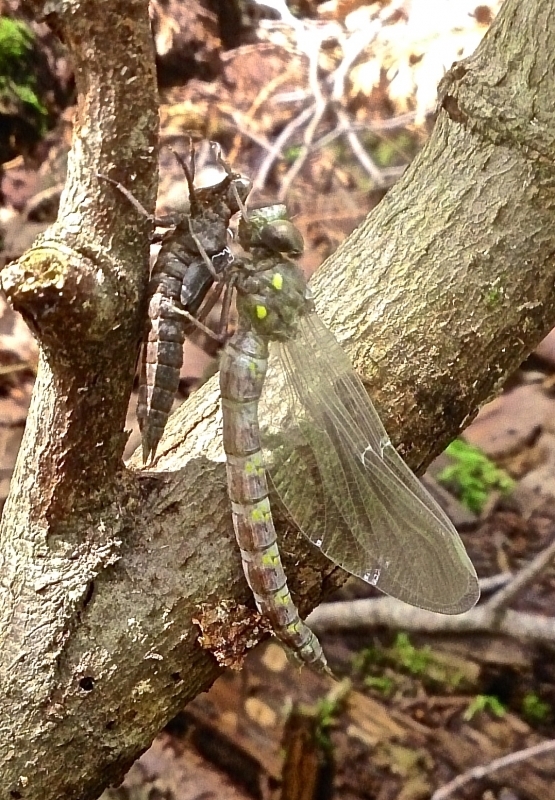 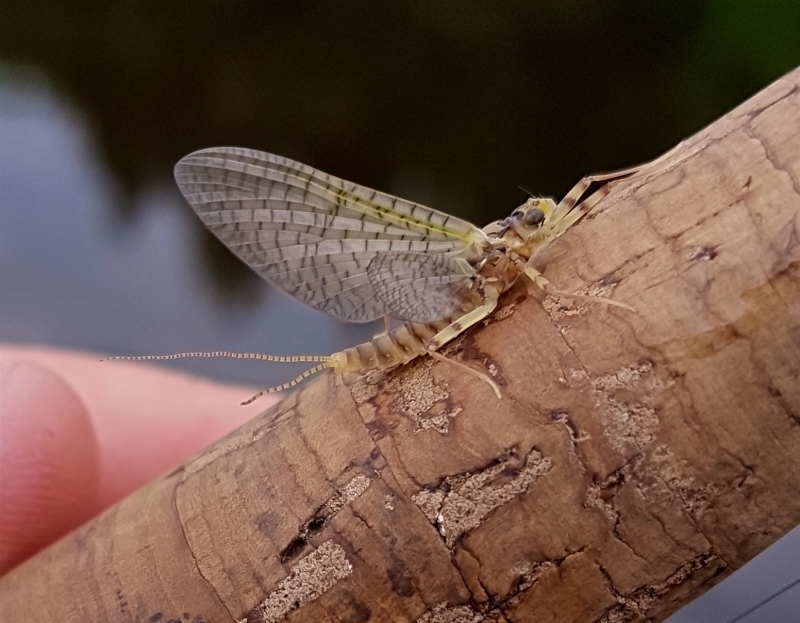 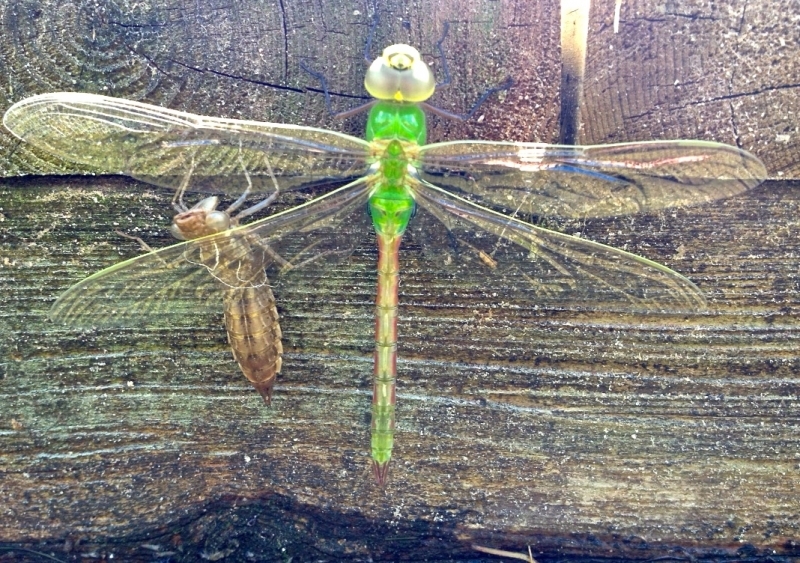 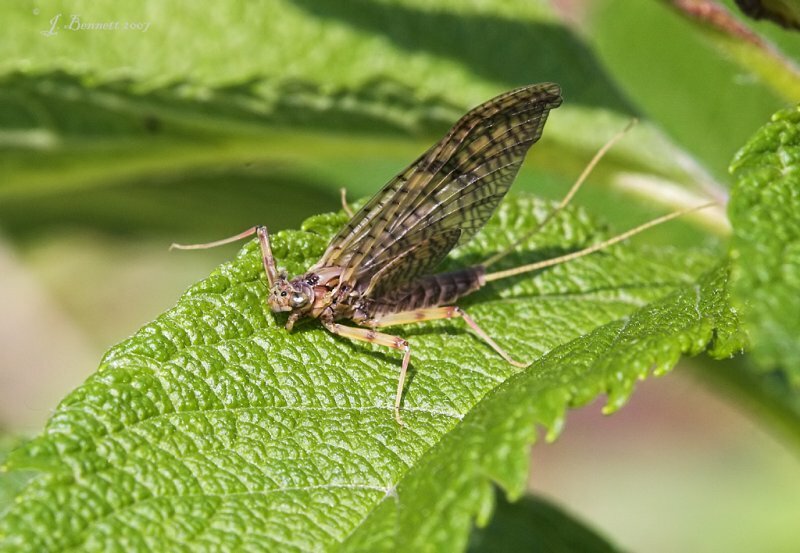 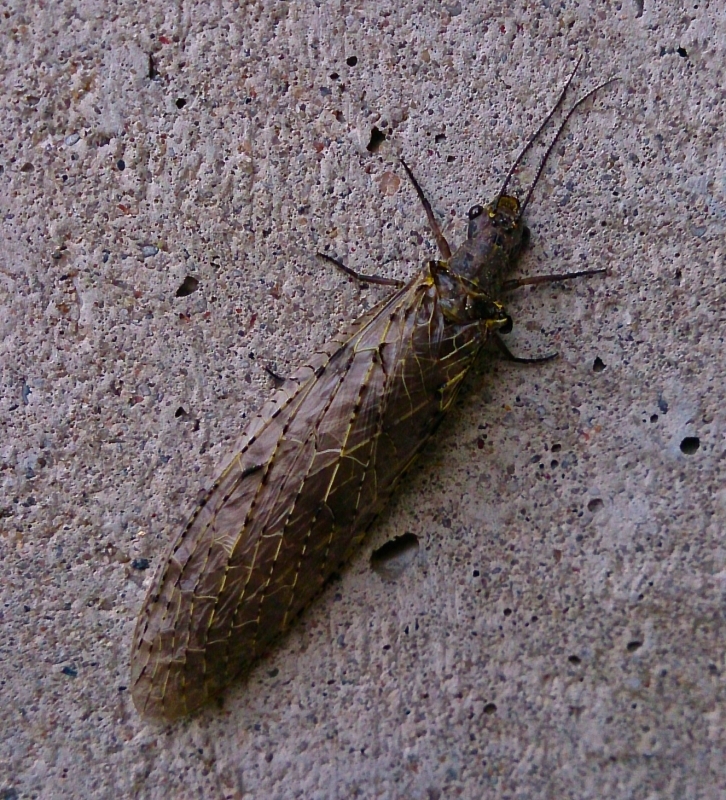 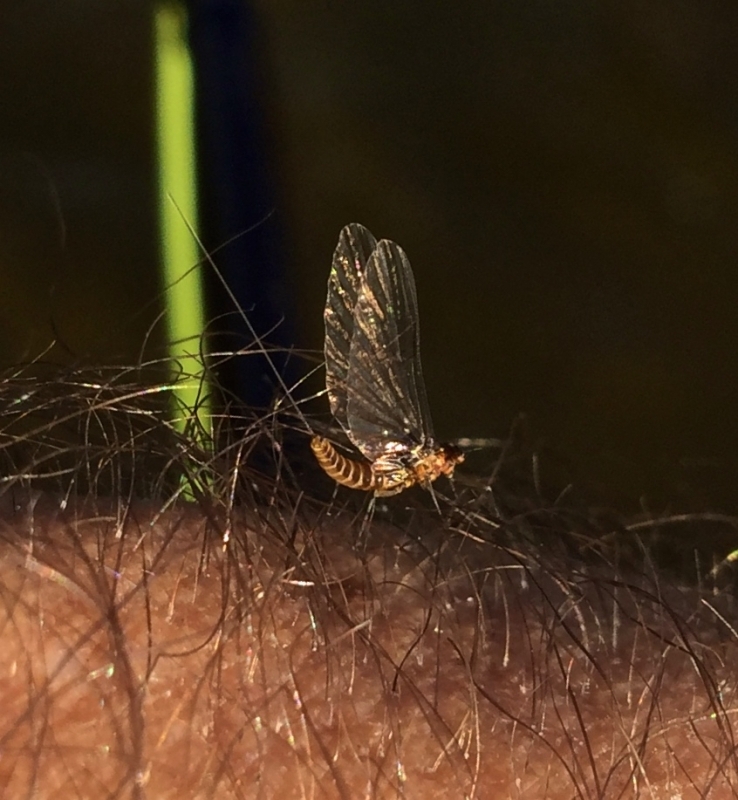 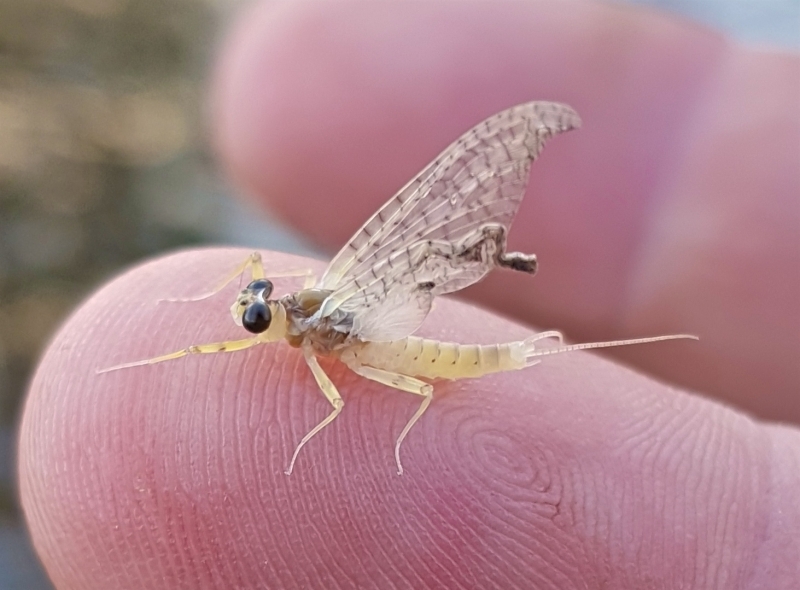 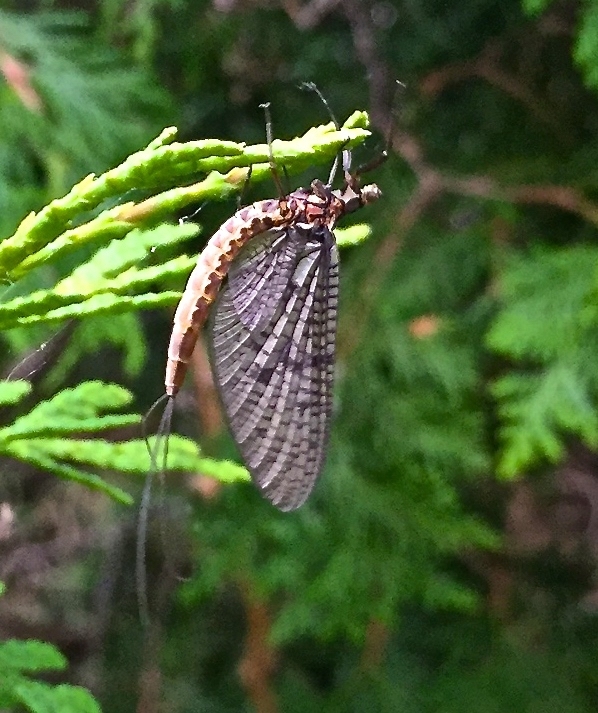 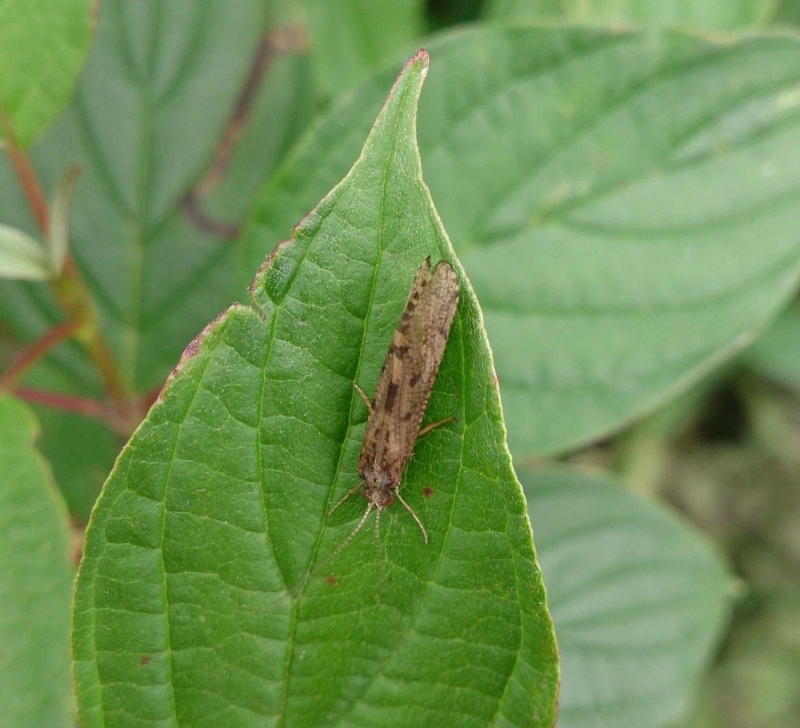 A March Brown and Mayfly Nymph. 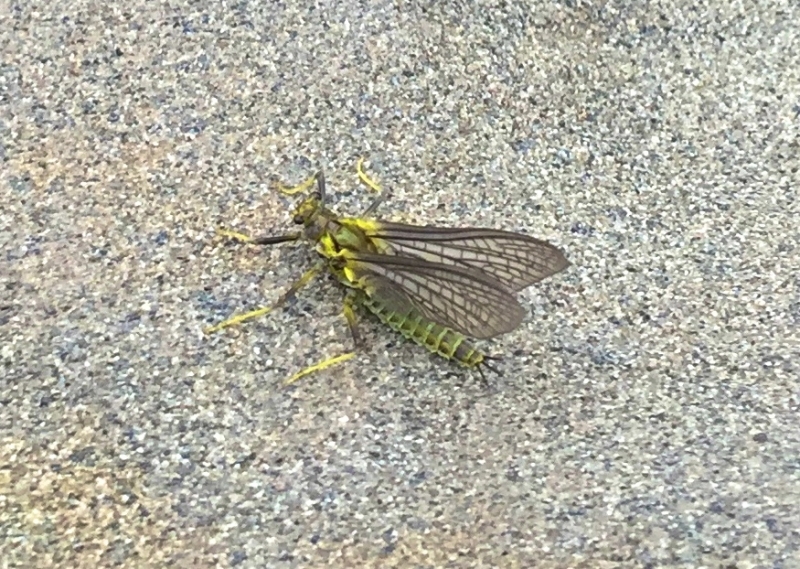 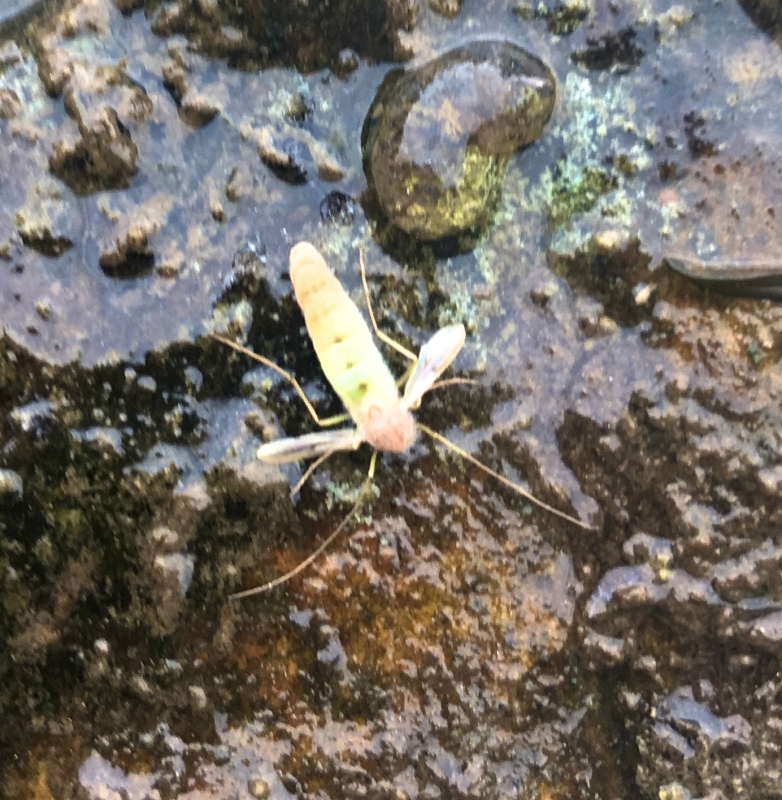 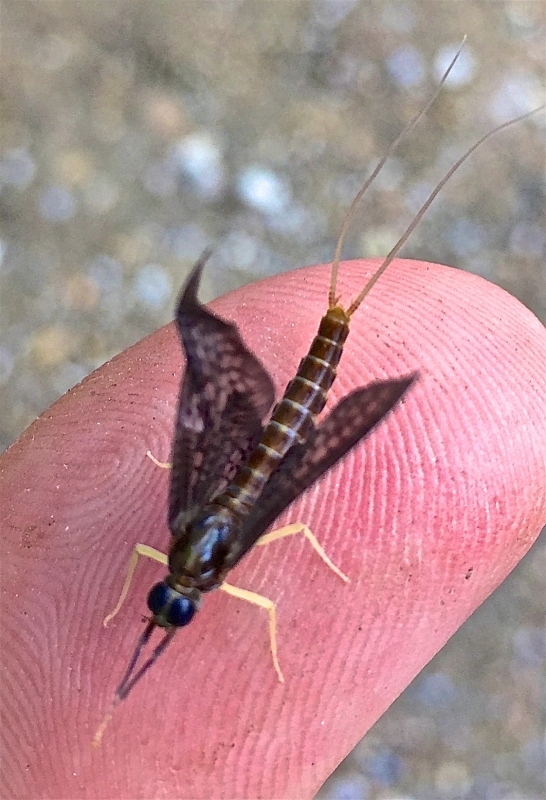 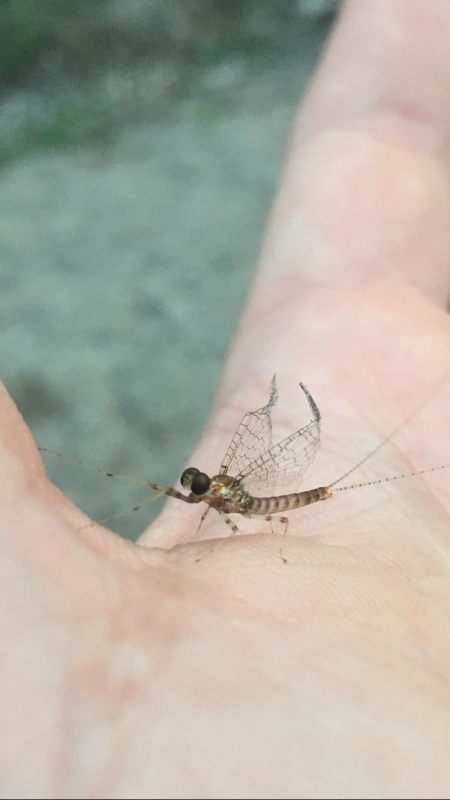 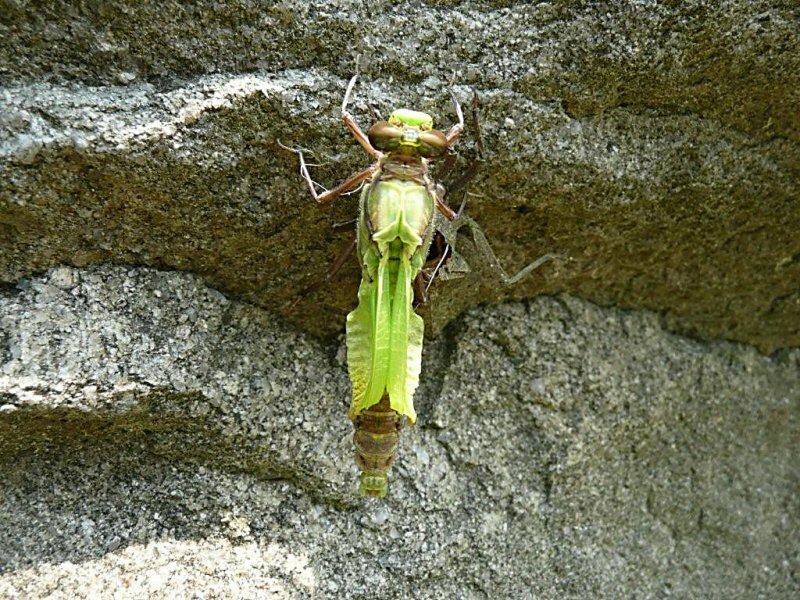 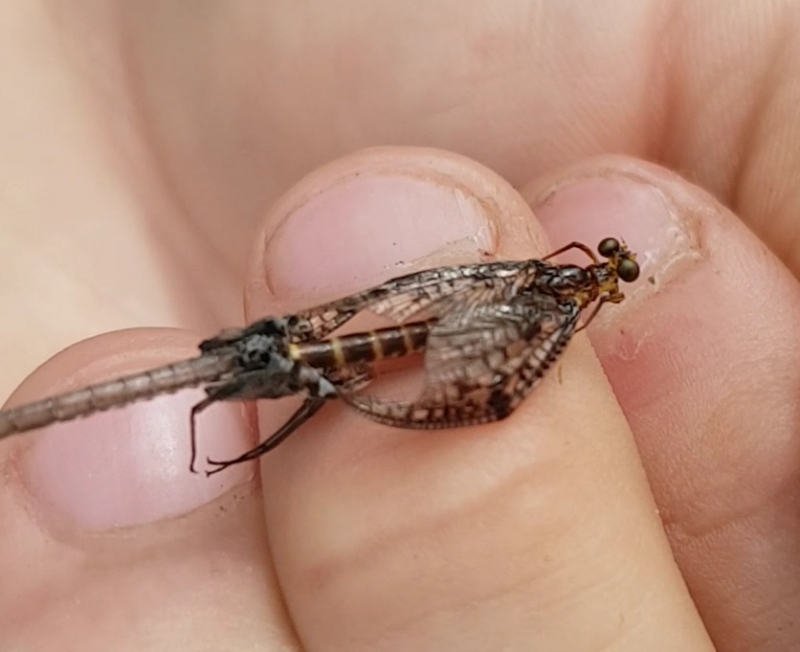 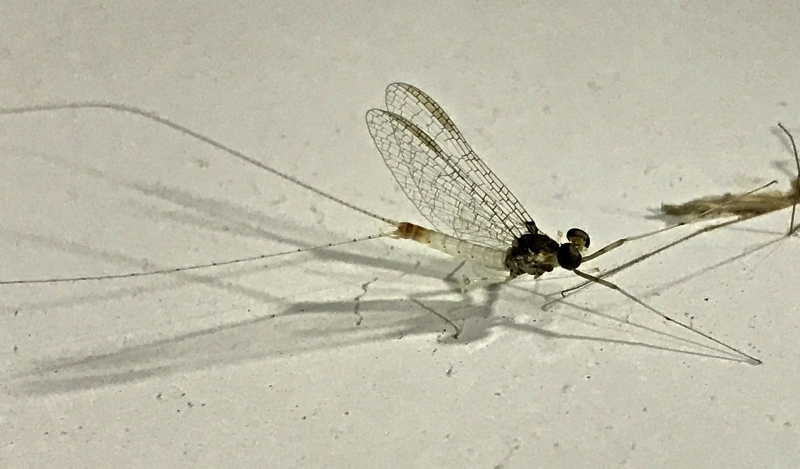 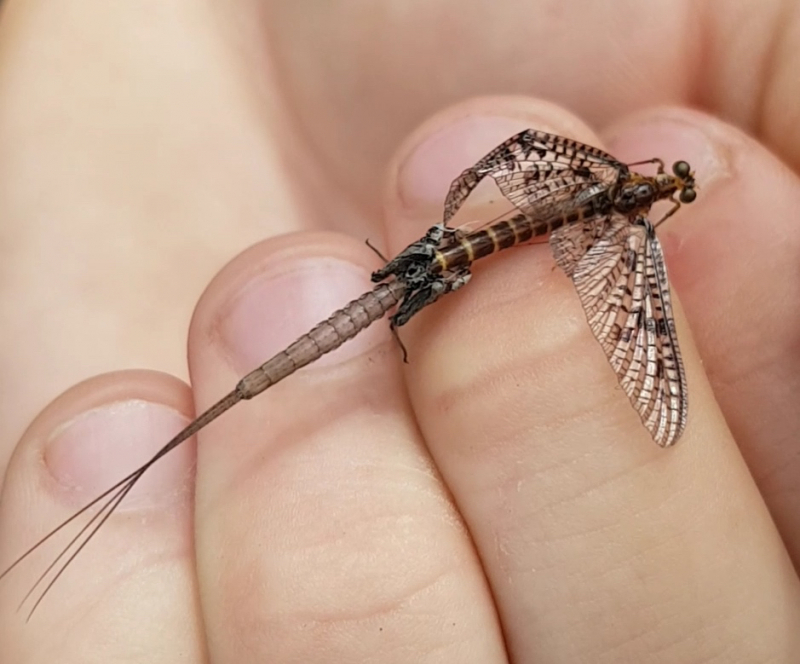 A Mayfly - Redfox Nymph. 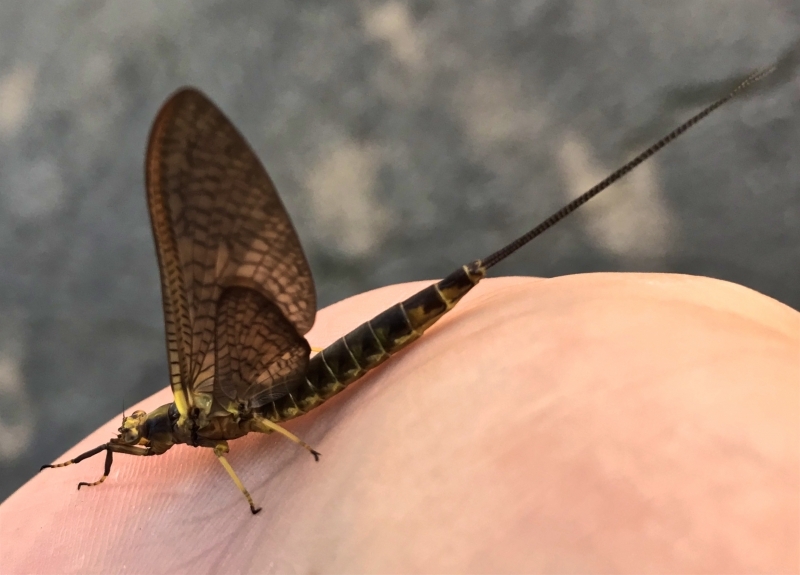 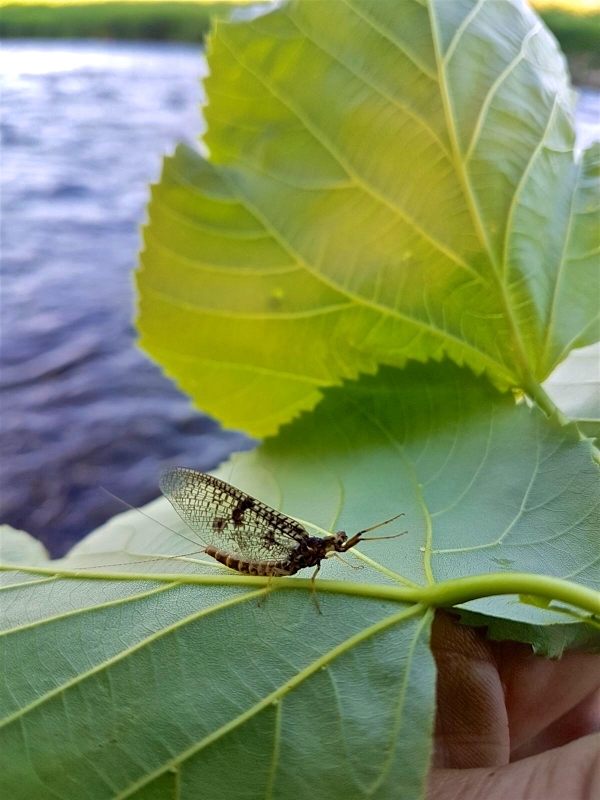 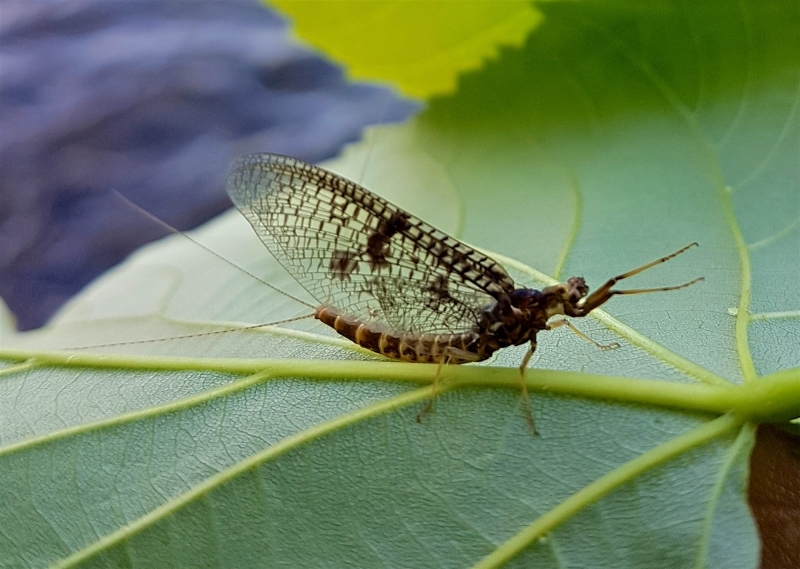 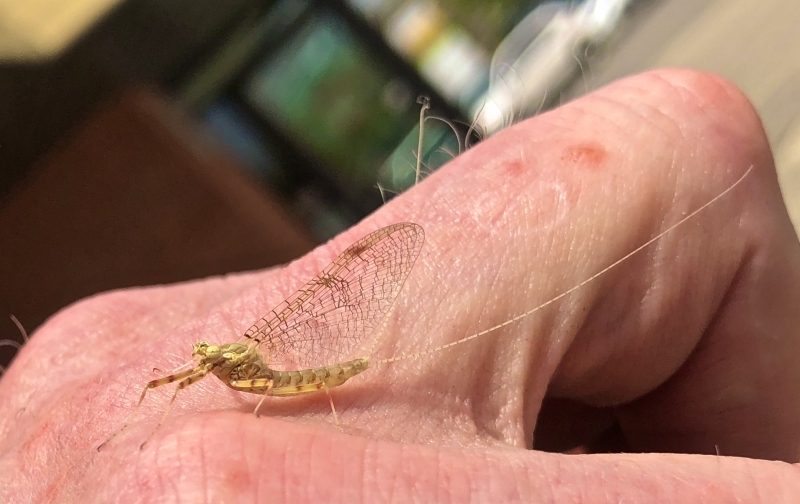 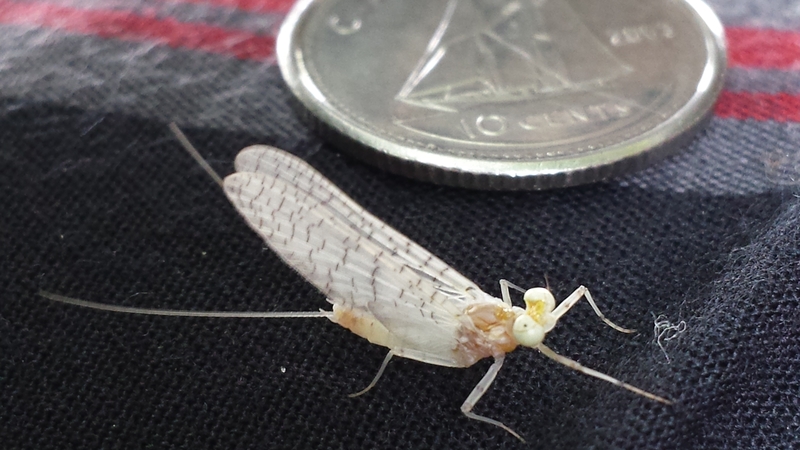 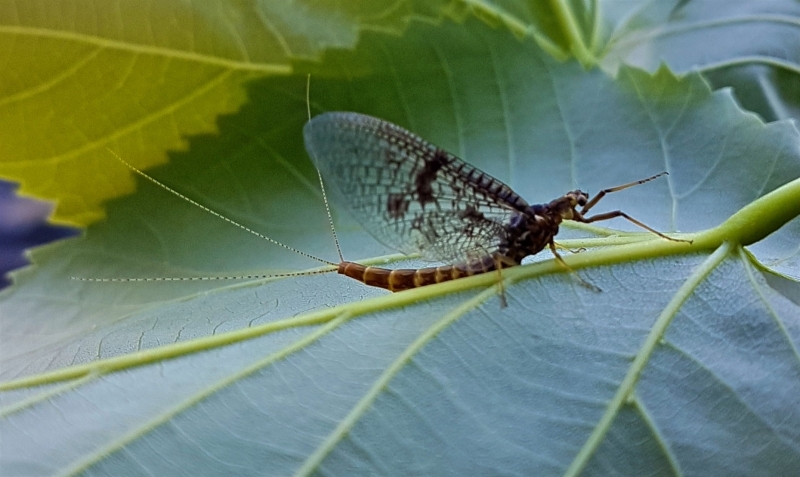 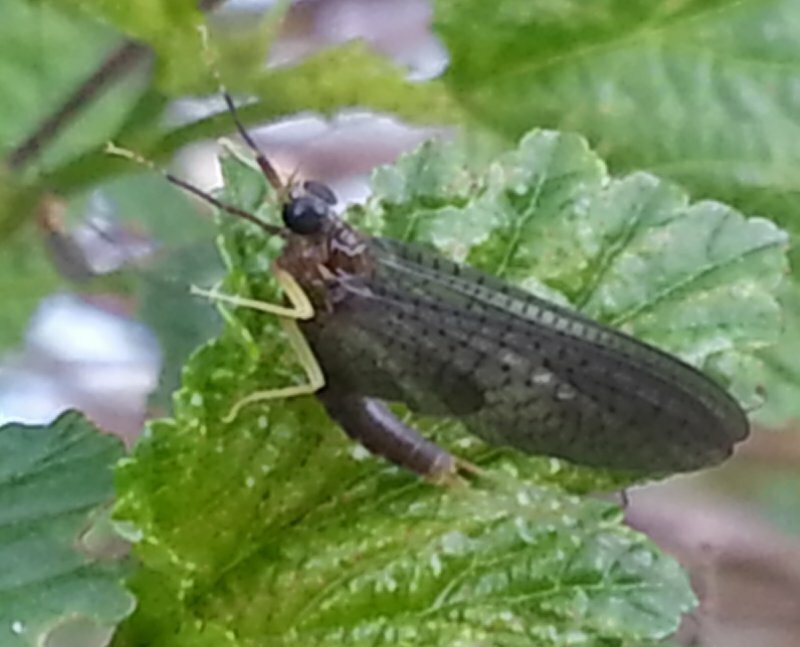 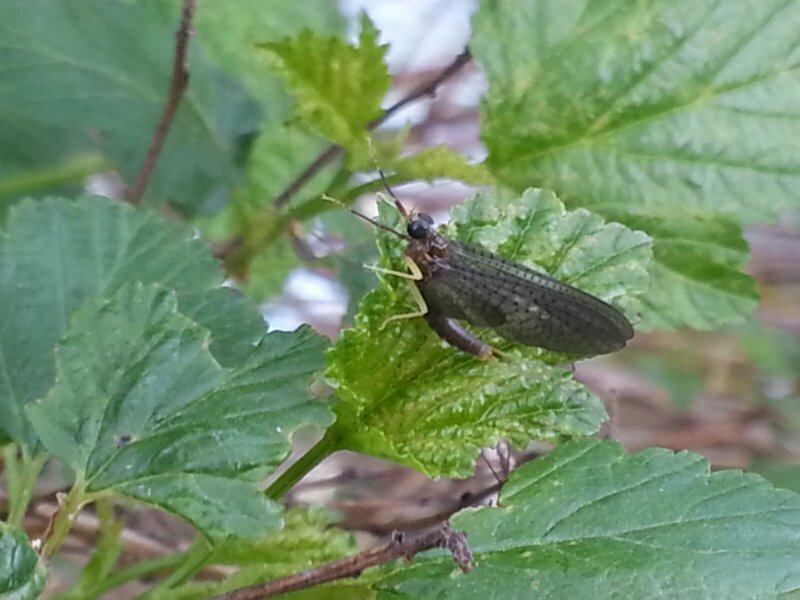 A Mayfly Dun on a leaf on the Grand River. 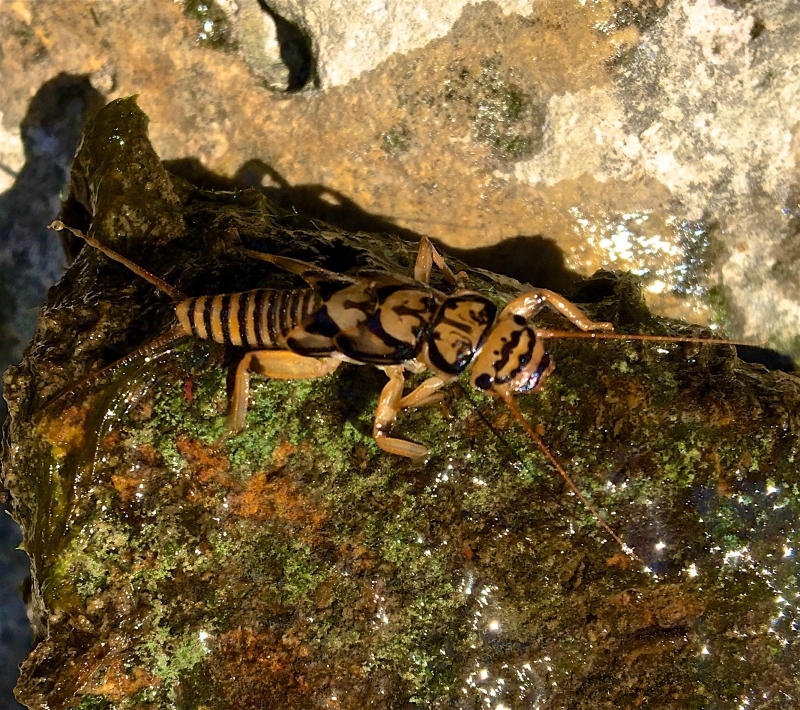 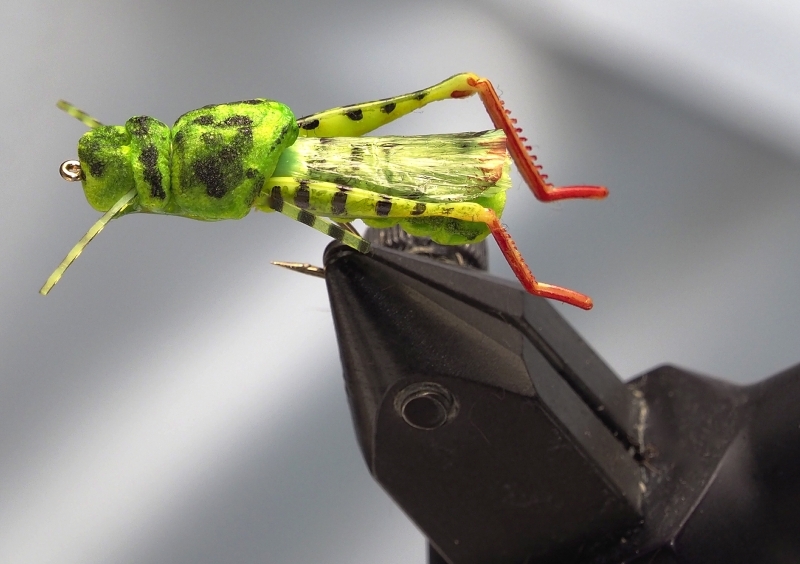 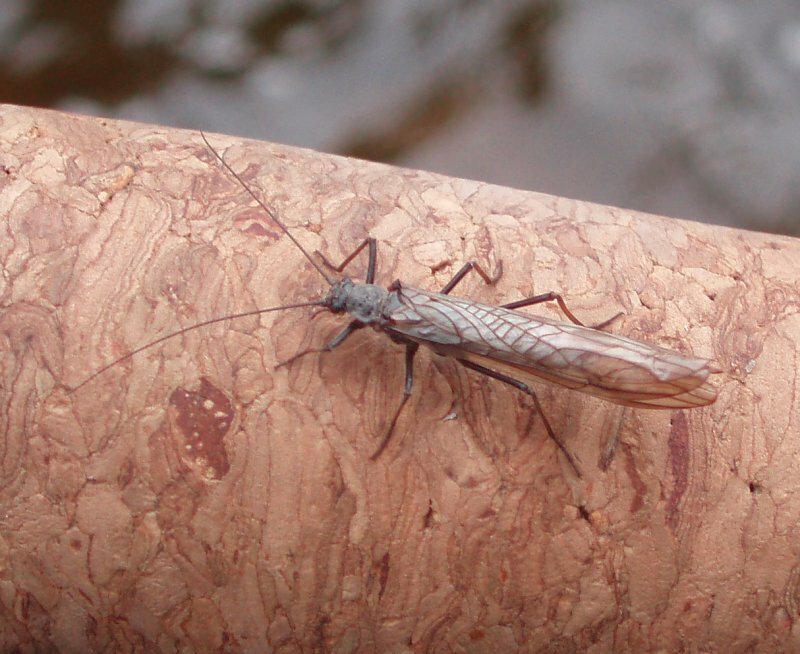 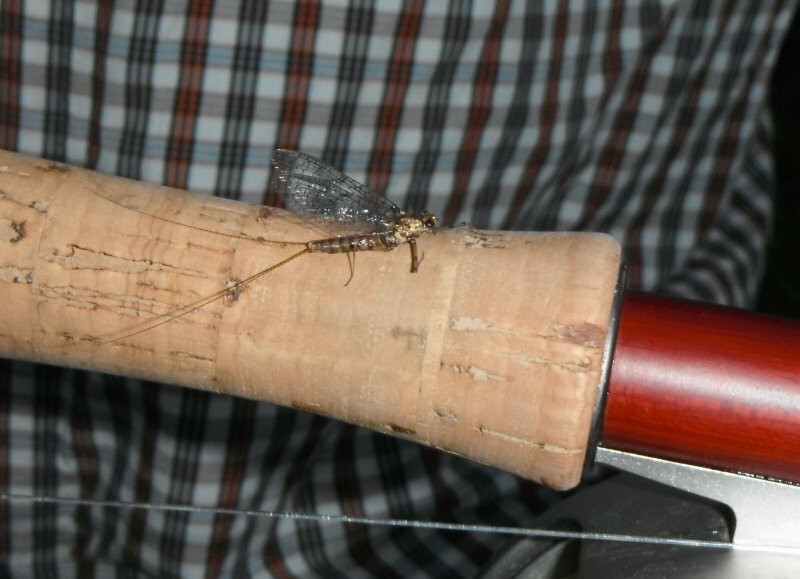 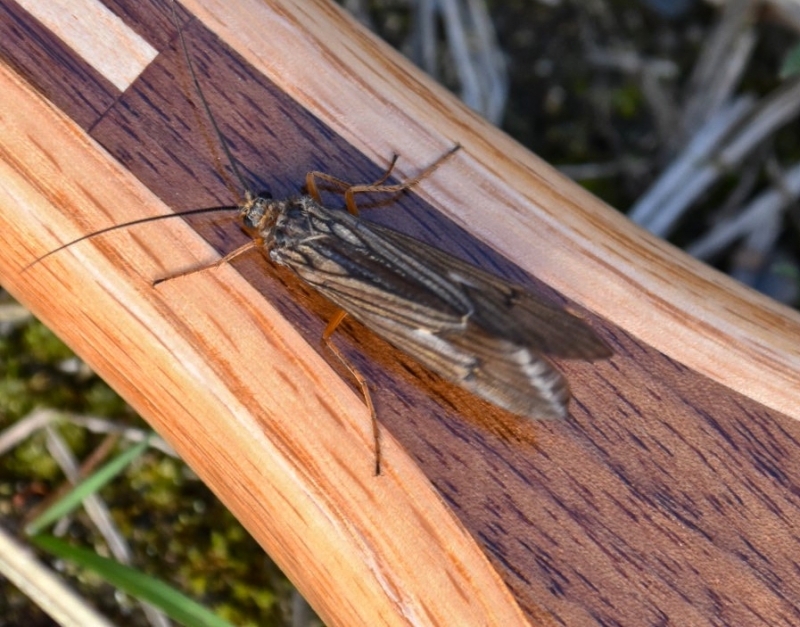 A Grand River Stonefly on a fly rod handle. 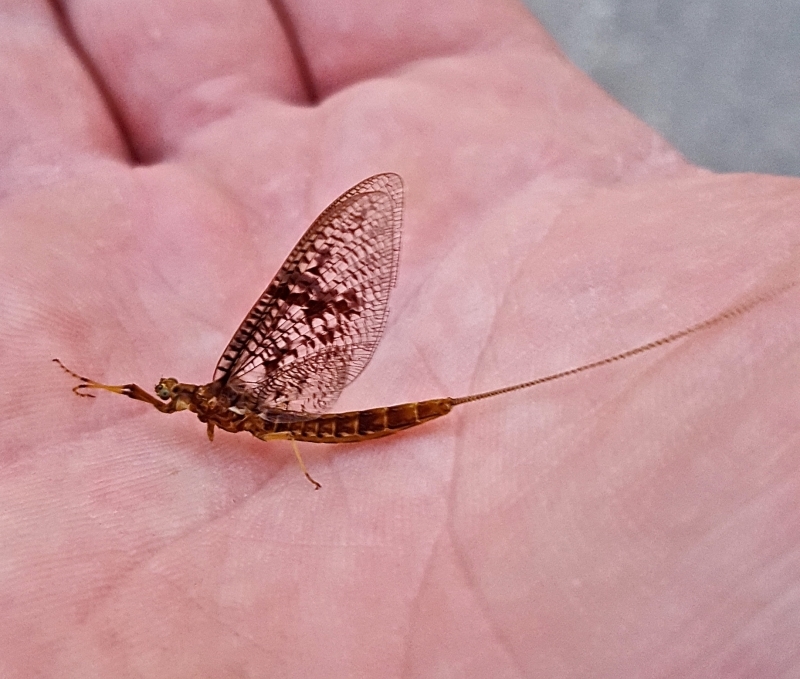 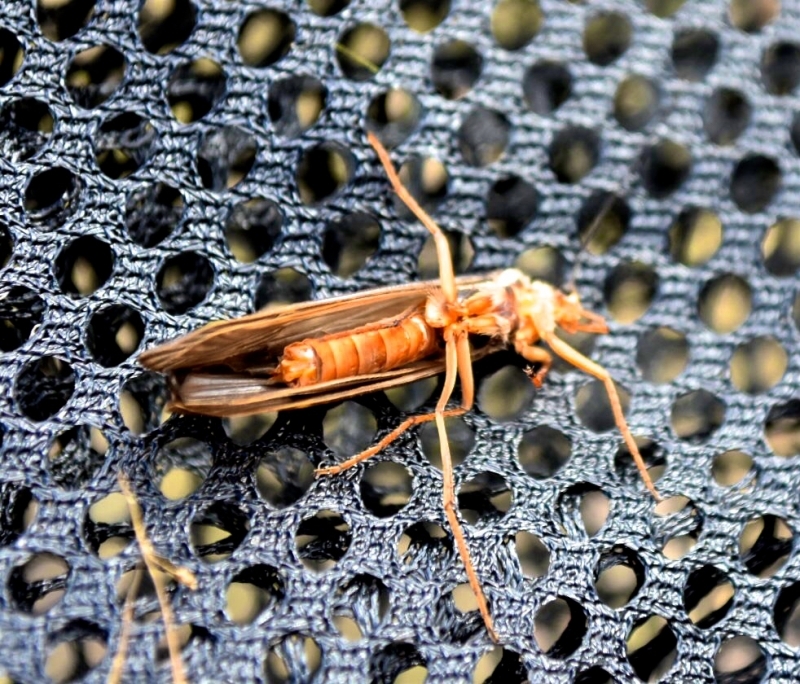 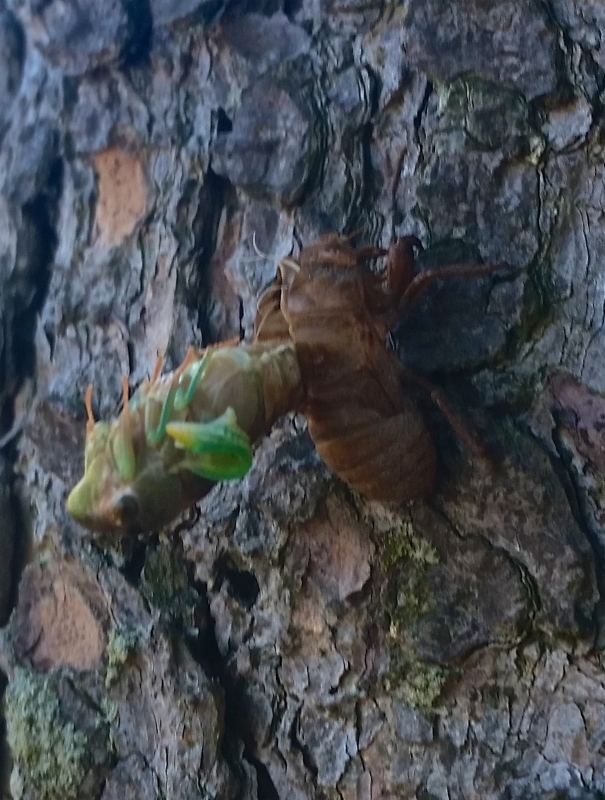 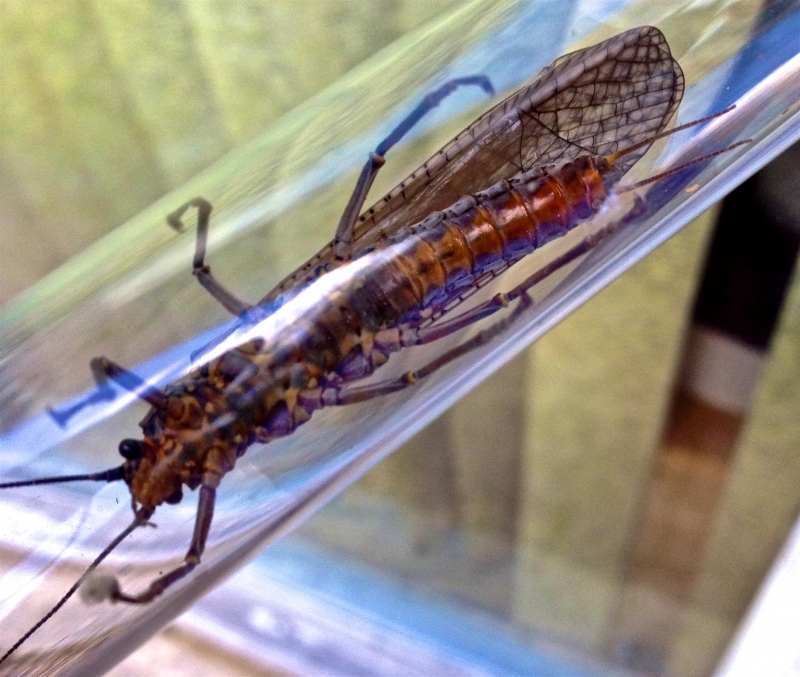 A Dobsonfly on a Waterworks/ Lamson Fly Reel on the Grand River. 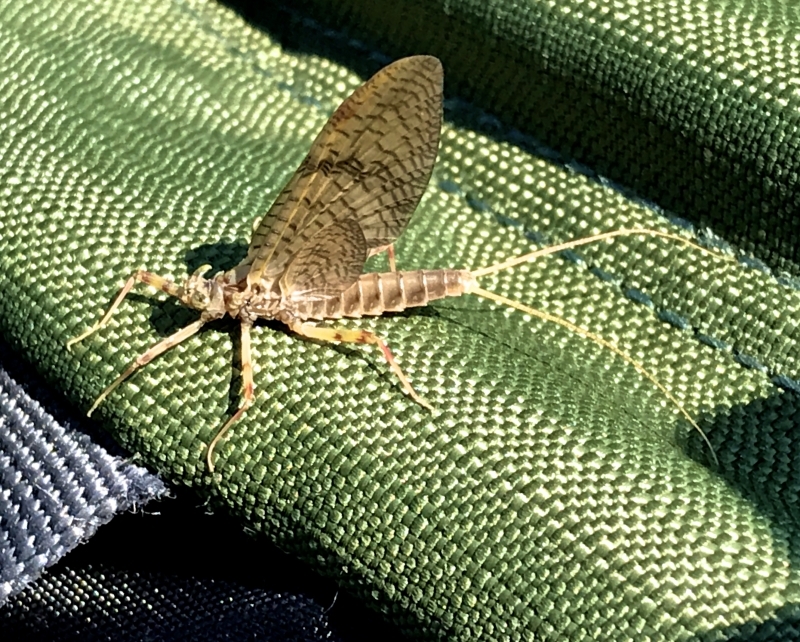 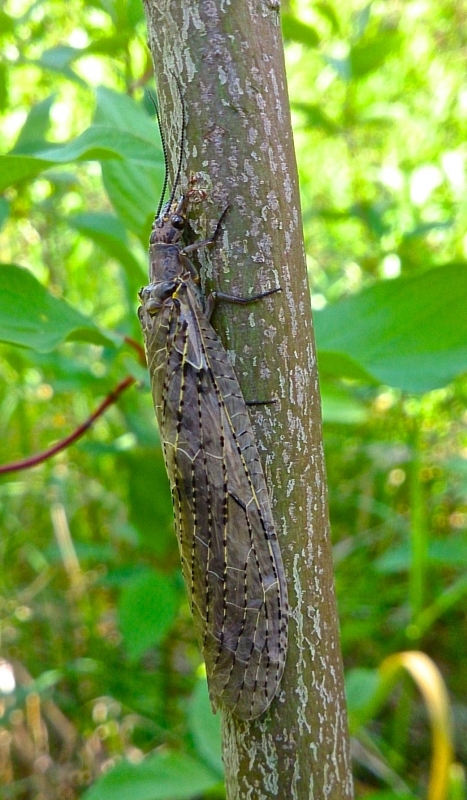 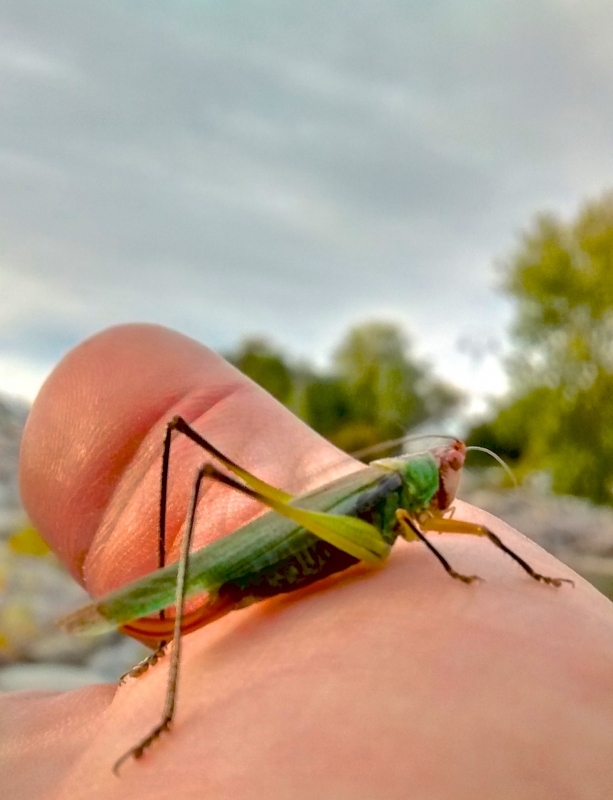 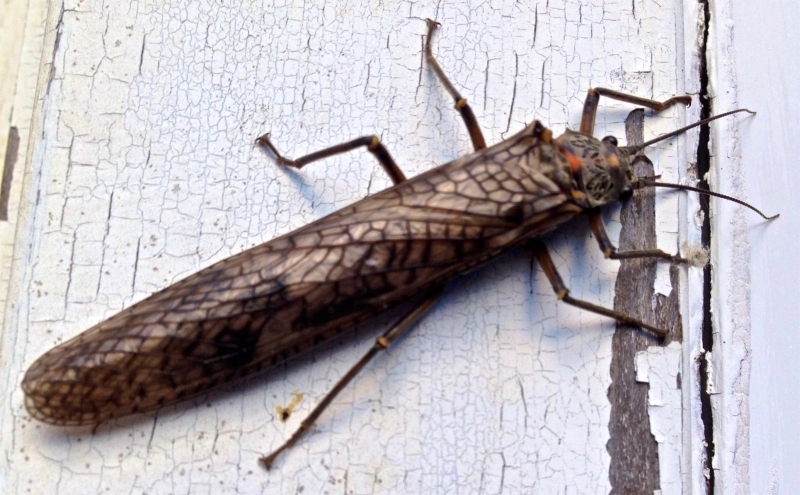 A Dobsonfly on the Grand River.